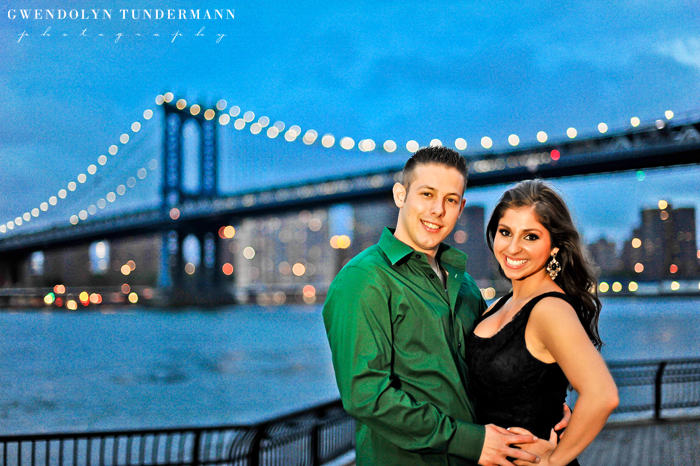 Over the weekend, I went to New York to hang out with Carolyn & Cris for their engagement photos in Brooklyn! 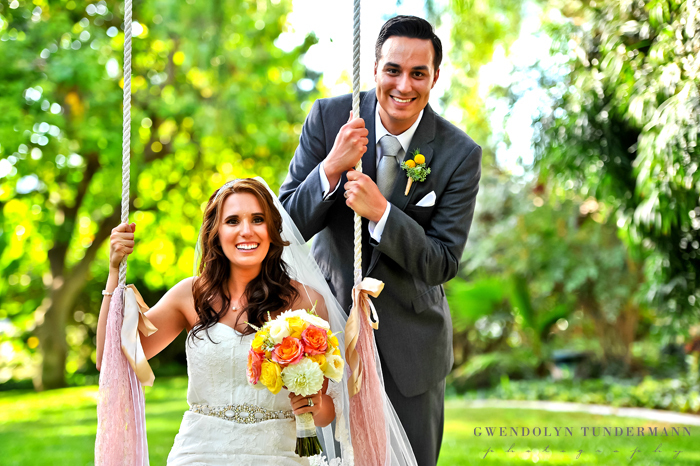 They are sweet, down-to-earth, and beyond cute together! 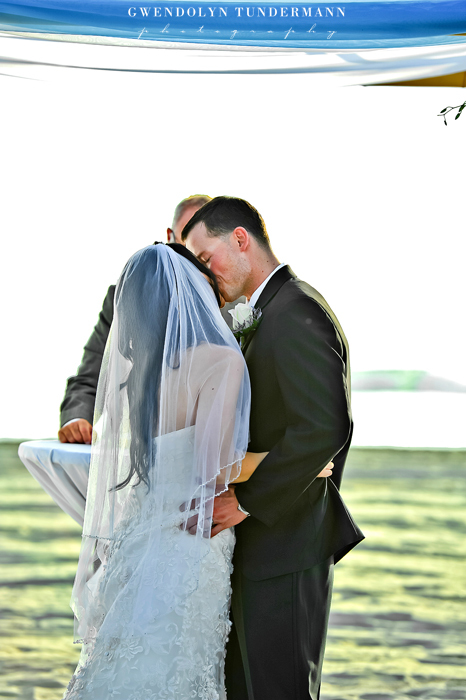 It was so much fun learning more about them as we walked along the water with the iconic Brooklyn Bridge in the background. 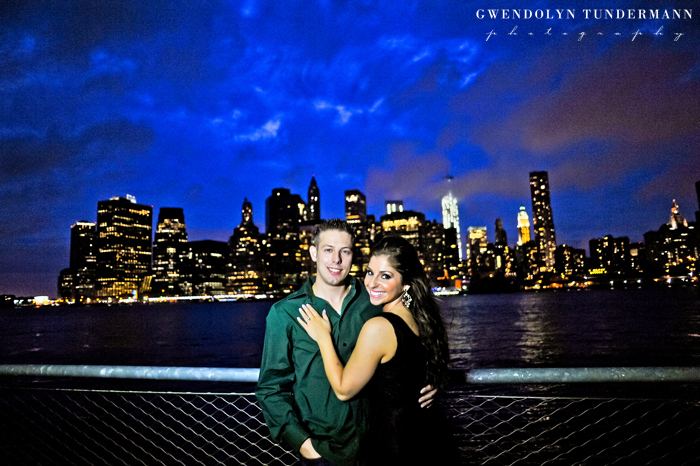 They chose Brooklyn for their engagement photos because Cris proposed at a park with a view of the Brooklyn Bridge in the background. 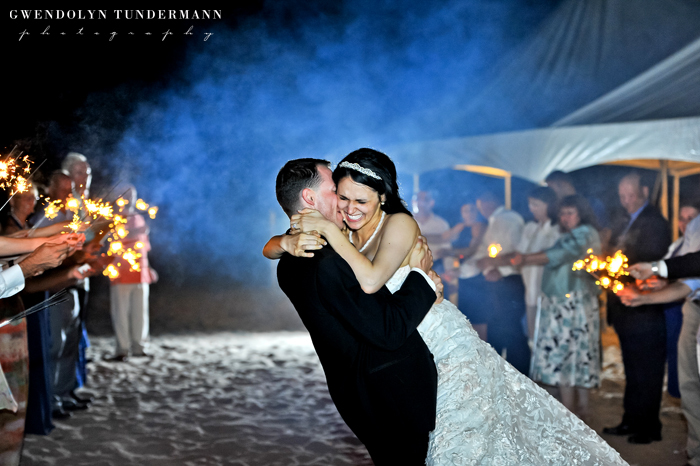 I mean, really, can you ask for a better view for such a special moment?! 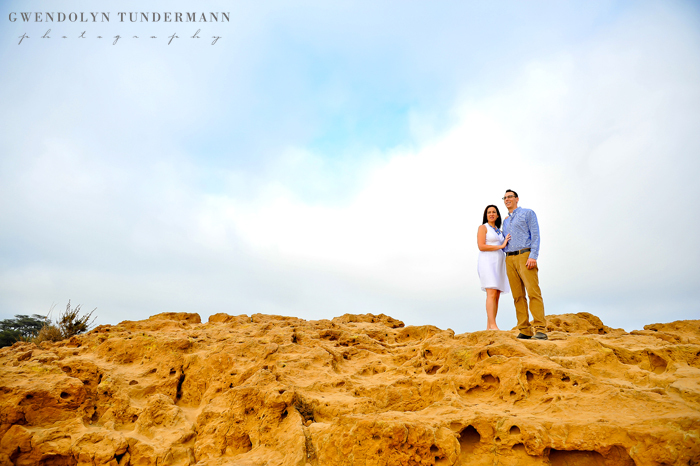 As the afternoon continued, the clouds got thicker (there was a forecast for rain that evening) and the lights of the city bounced around in between the clouds. 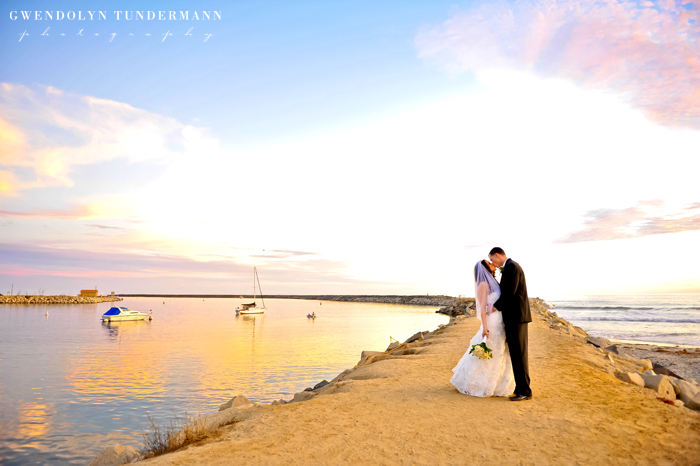 Some of the clouds were so low they even covered the top of the buildings. 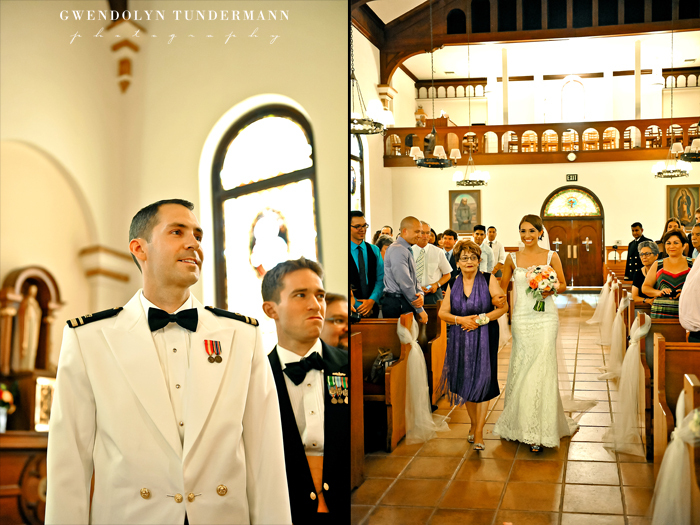 It looked surreal! 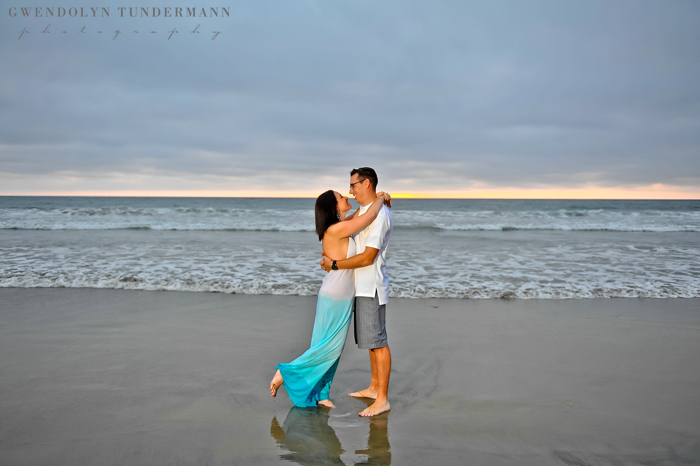 I was so glad that the rain held off for their session and that we ended up with such an amazing sky! 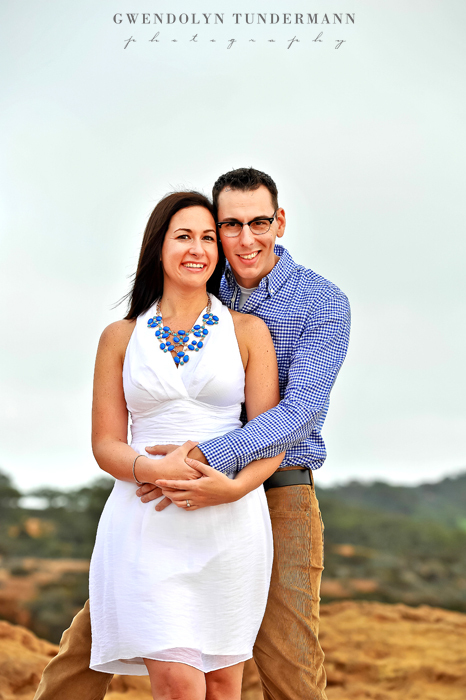 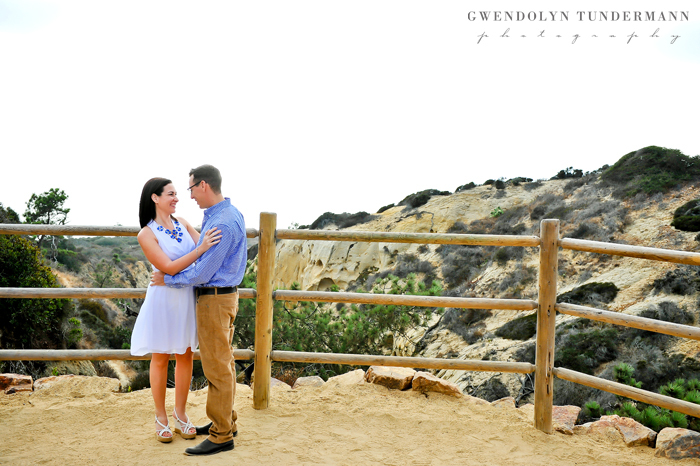 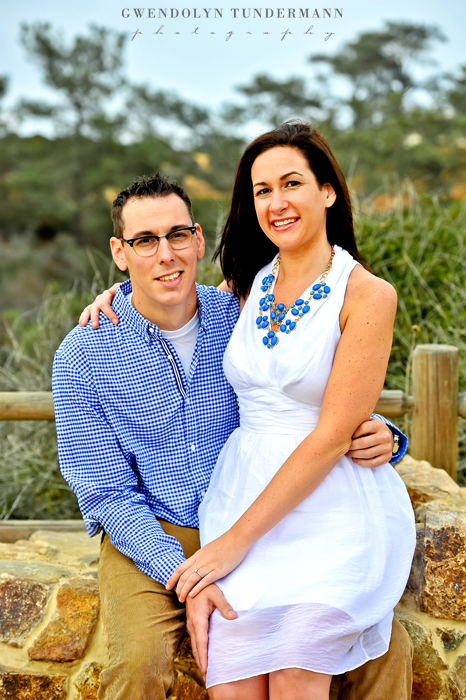 We had a fun time hanging out with Karen & Nathan for their beautiful engagement photos at Torrey Pines. 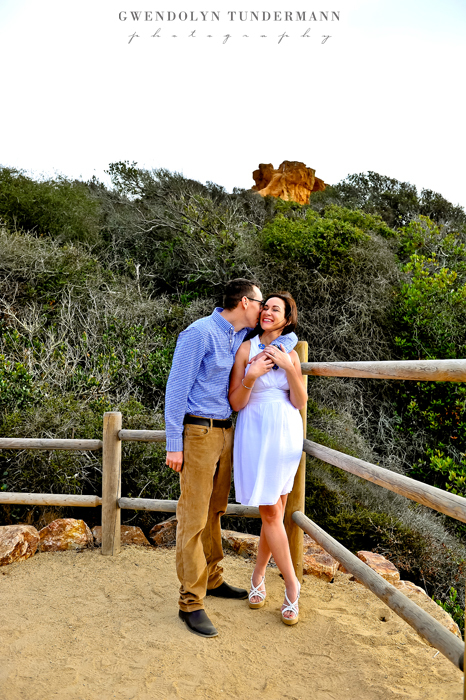 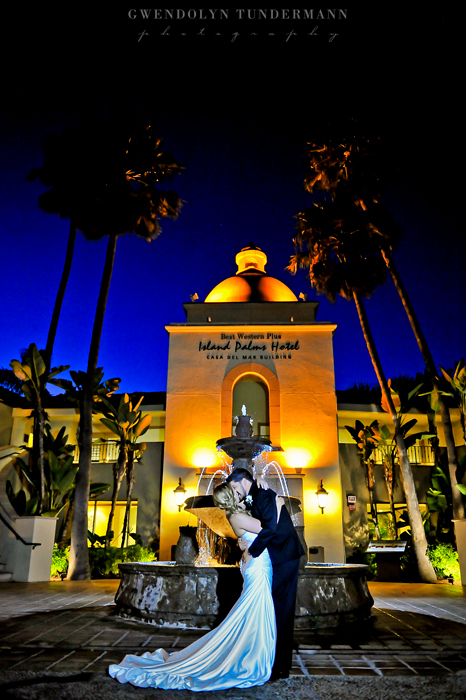 In addition to being a gorgeous location, it’s a special place for Karen & Nathan because it’s where they got engaged! 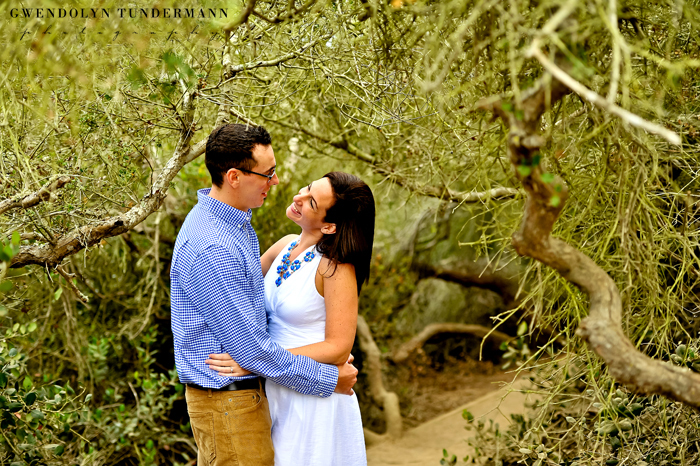 We enjoyed getting to know them better as we walked around the maze of trails weaving throughout the park! 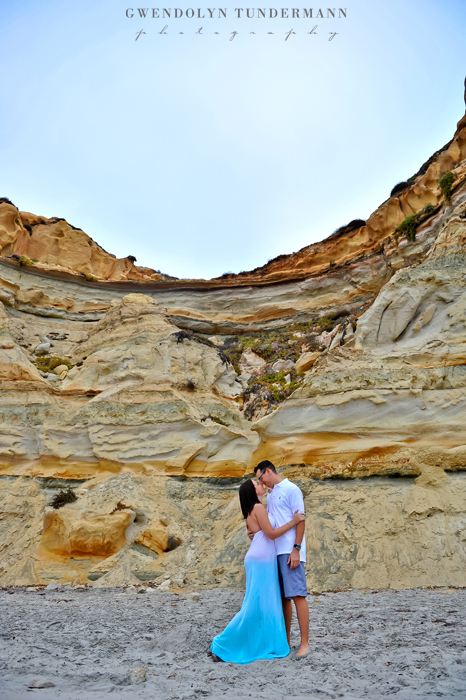 After some photos at the top of the park, we ventured down to the shore and walked along the classic California coast. 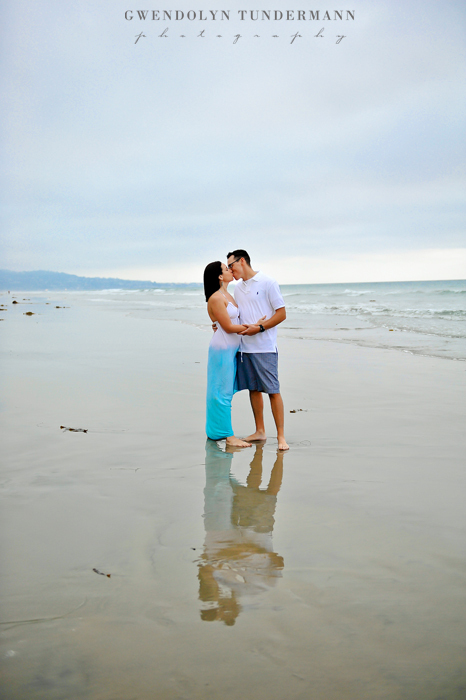 Karen and Nathan kicked off their shoes and walked in the sand, occasionally dipping their toes into the chilly water. 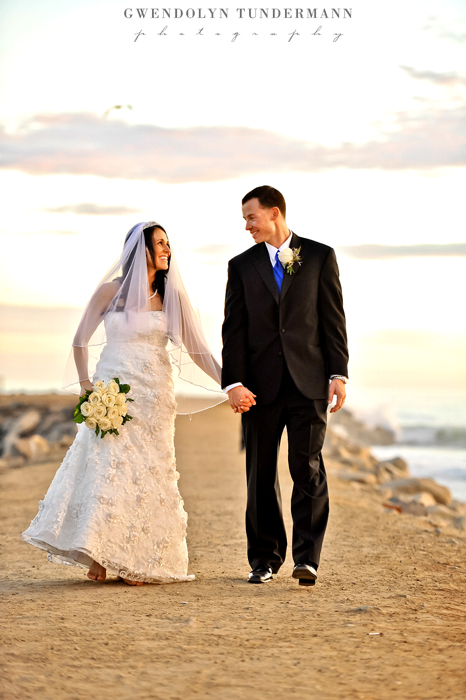 We waited for the sun to set, and although it was overcast the clouds diffused the bright light and allowed us to see the complete outline of the sun. 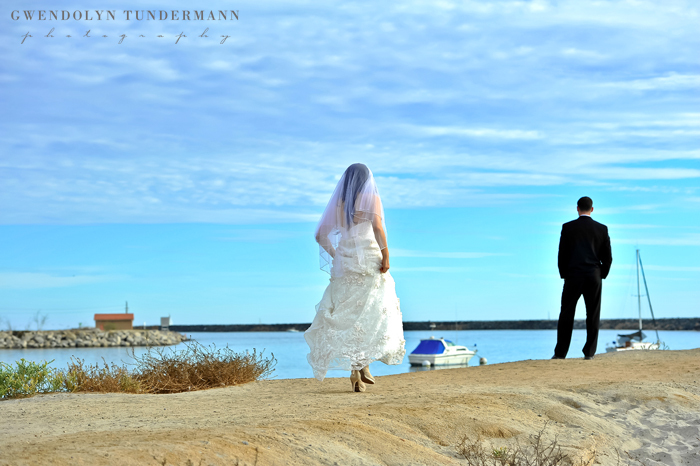 We watched as it approached the horizon, slowly at first and then all of a sudden disappearing from view. 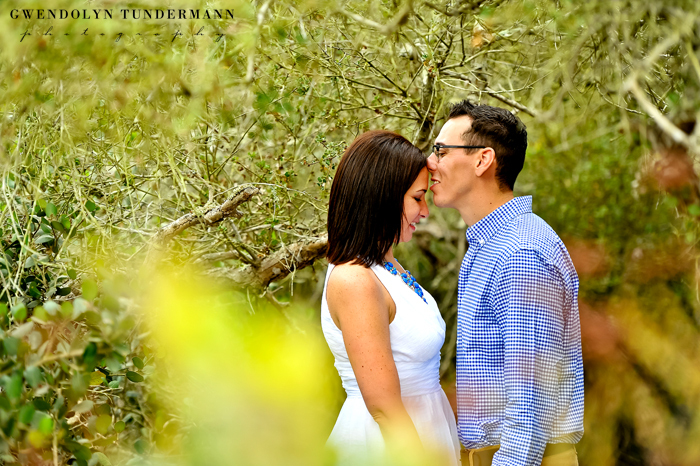 It was pretty amazing to watch! 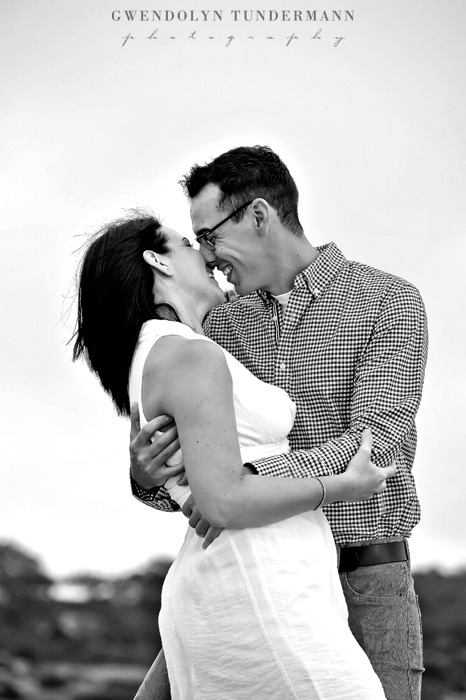 By the end of their engagement session, my cheeks were hurting from laughing so hard. 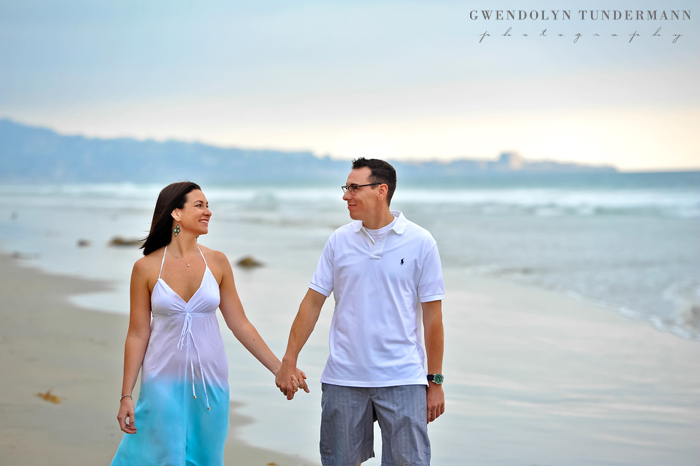 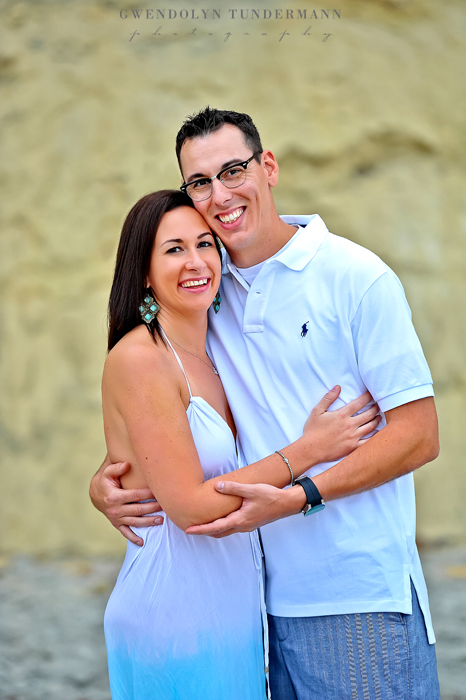 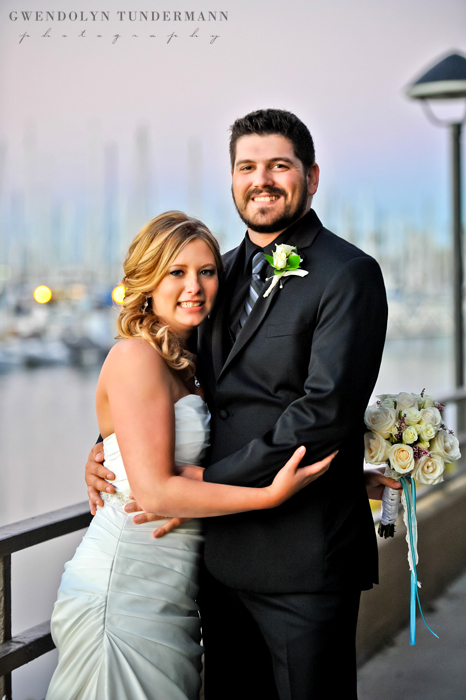 Karen & Nathan are so fun and outgoing that you feel like you’ve known them forever. 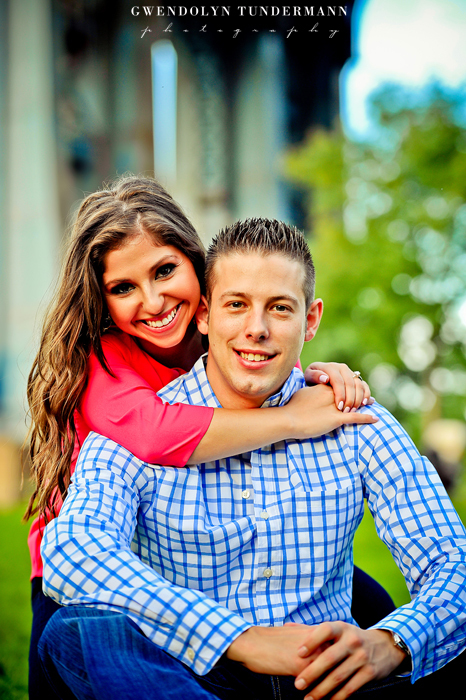 We can’t wait for their wedding next spring! 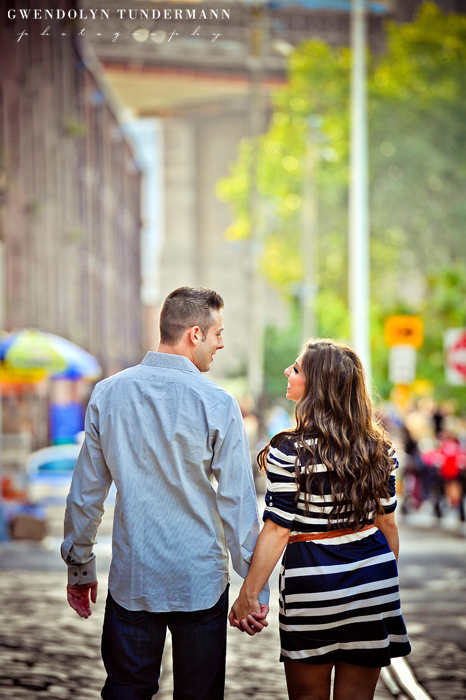 I had such a great time walking around Brooklyn tonight with this adorable couple! 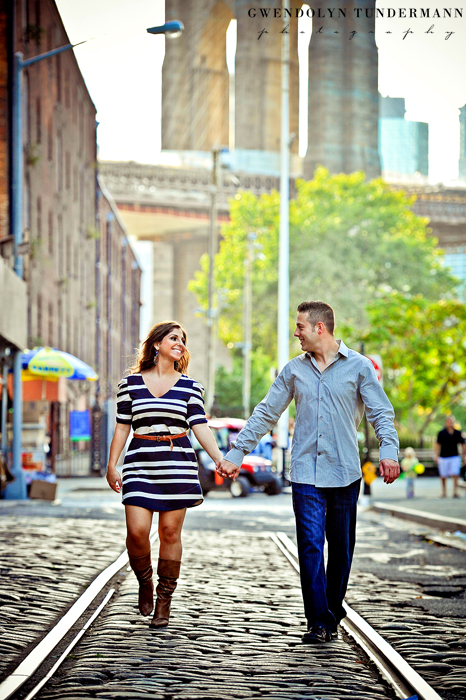 Carolyn & Cris wanted to shoot their engagement photos in Brooklyn because it’s where they got engaged! 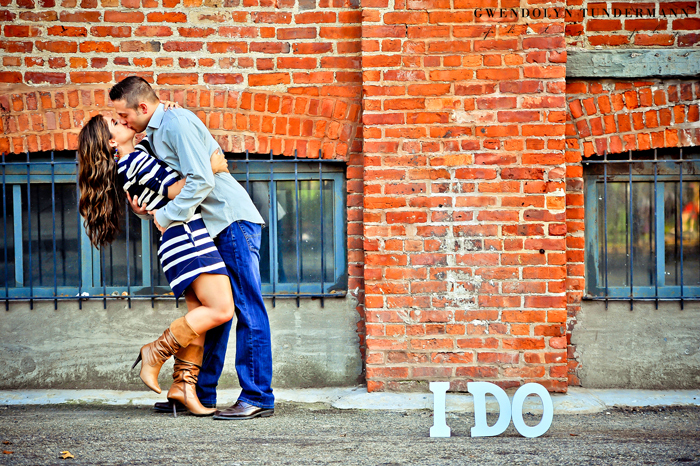 Such a beautiful place for a proposal, and you have to love that romantic view of the city! 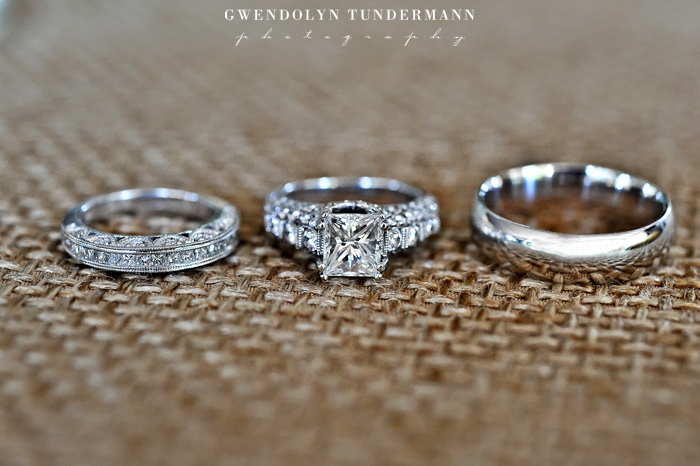 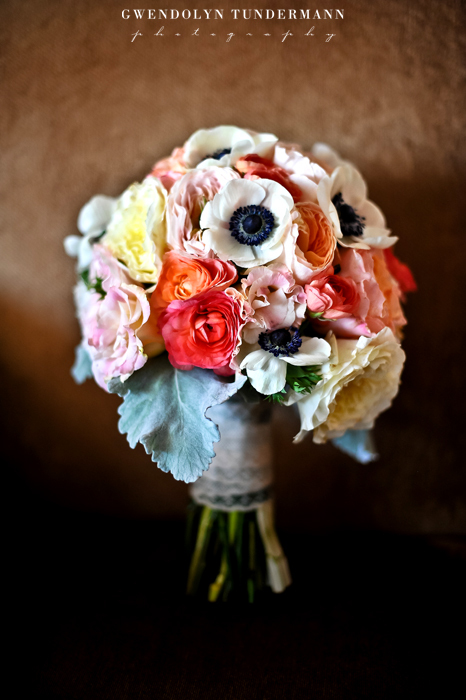 We have another huge blog post full of wedding pretties to share with you! 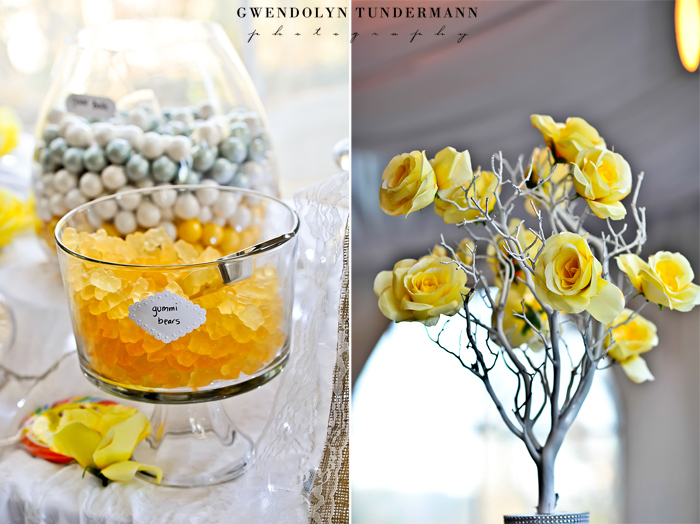 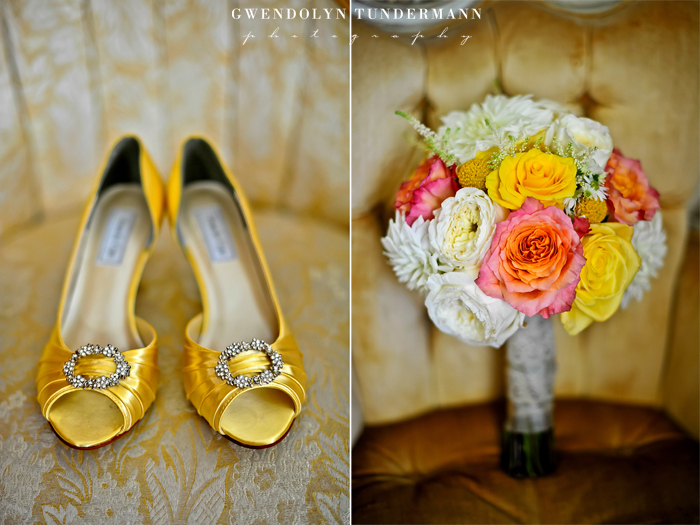 Christa & Roberto’s sweet wedding at Green Gables Estate was filled with pretty yellow details at this charming historic venue! 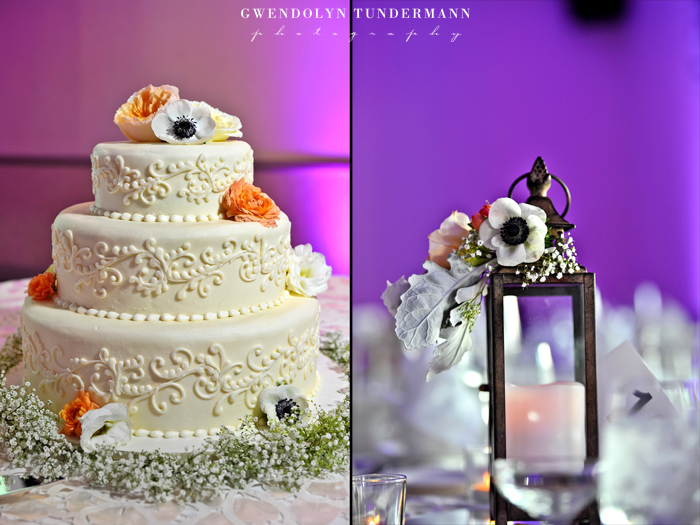 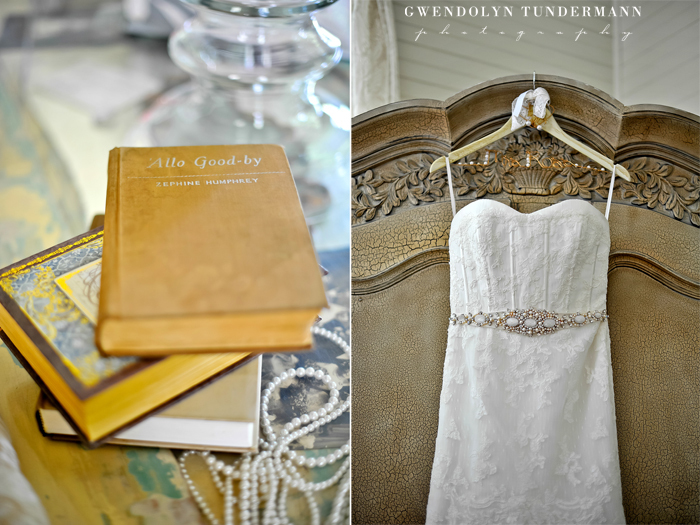 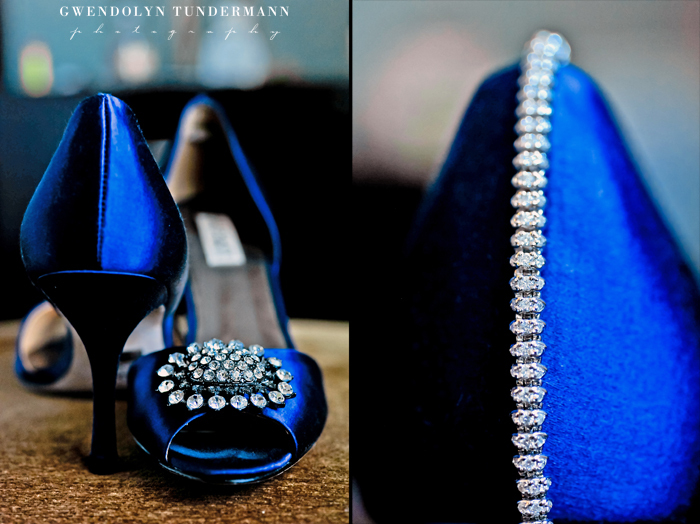 It’s so beautiful how it all came together, including some of the details that Christa made herself! 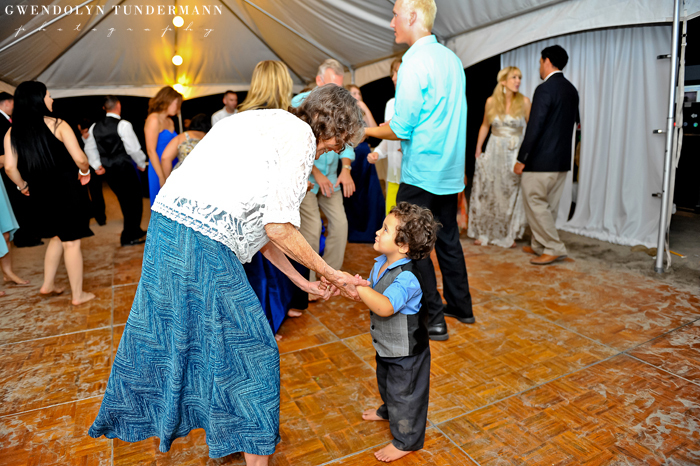 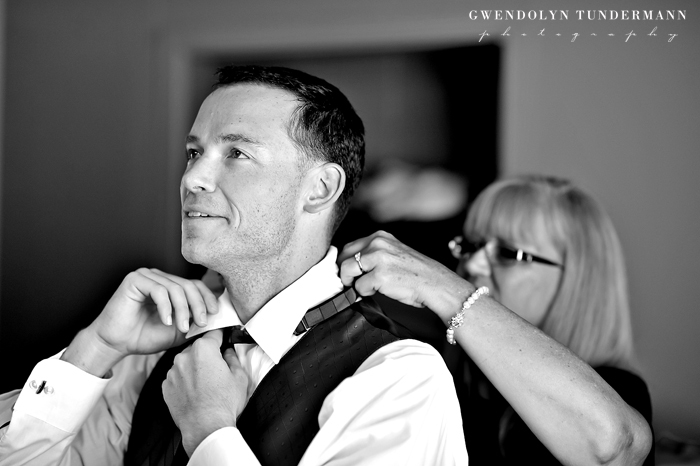 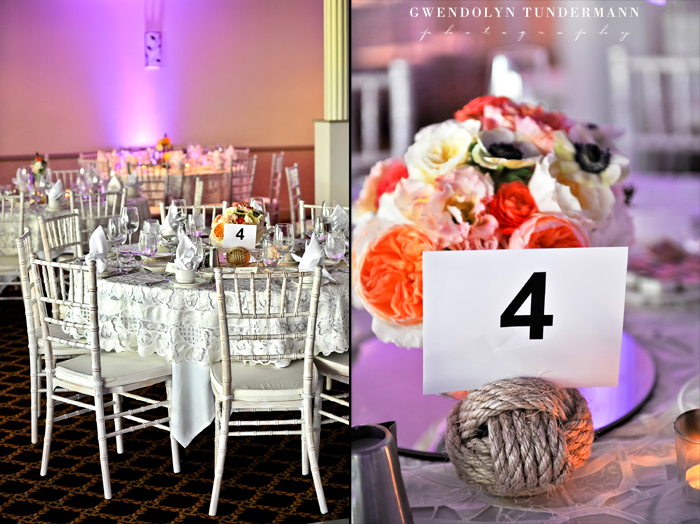 Those kind of personal touches always make a wedding extra special! 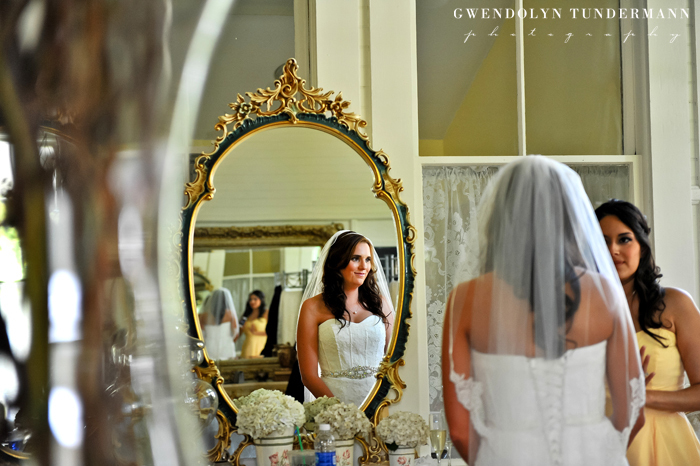 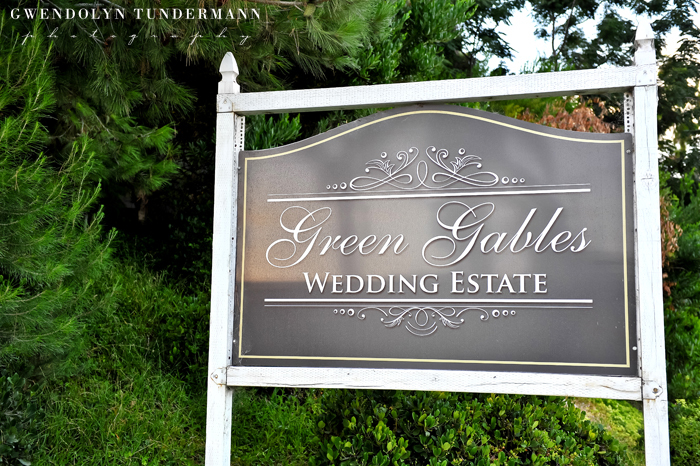 Green Gables Estate is a unique wedding venue that includes an old schoolhouse, which is where the bridal suite was located. 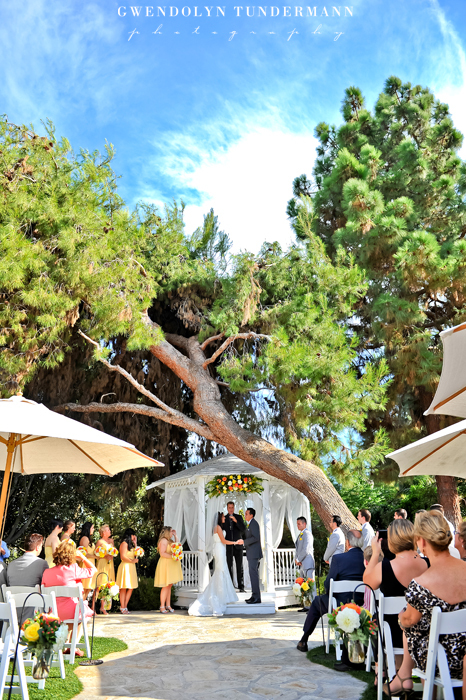 The property is surrounded by trees and greenery, making it secluded and perfect for an intimate evening! 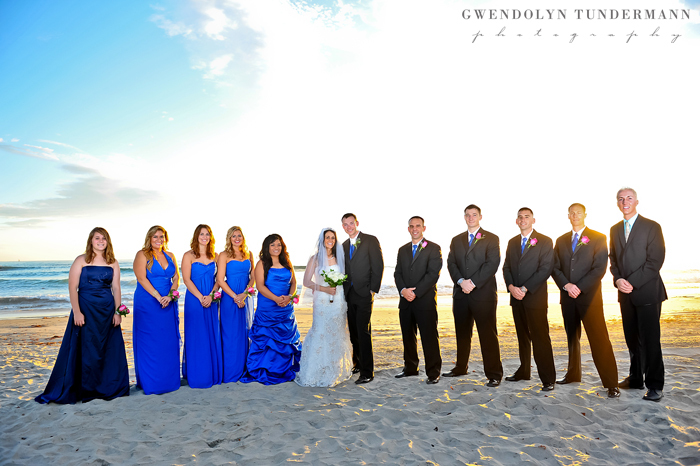 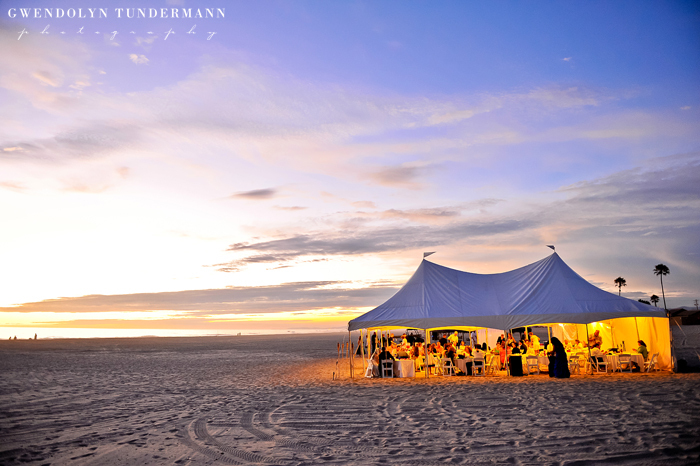 Christa & Roberto’s closest friends and family gathered here to share in their nuptials under bright blue skies! 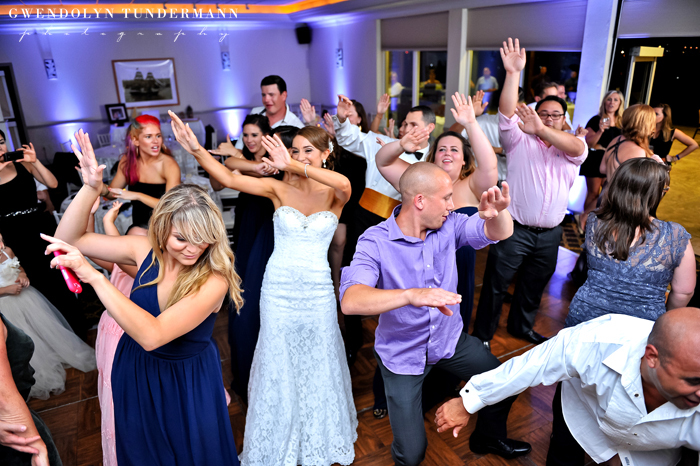 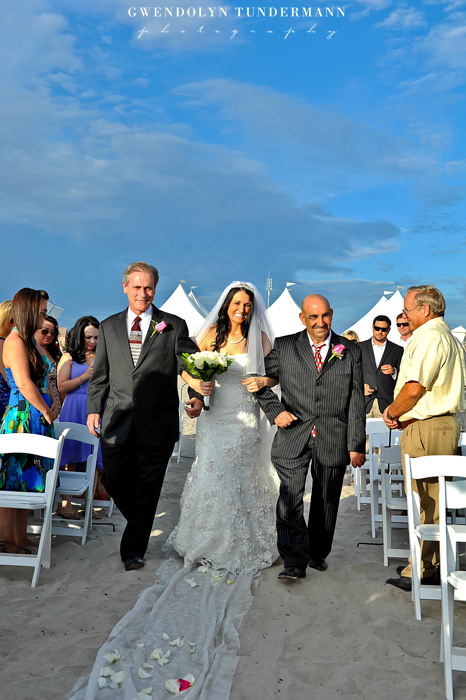 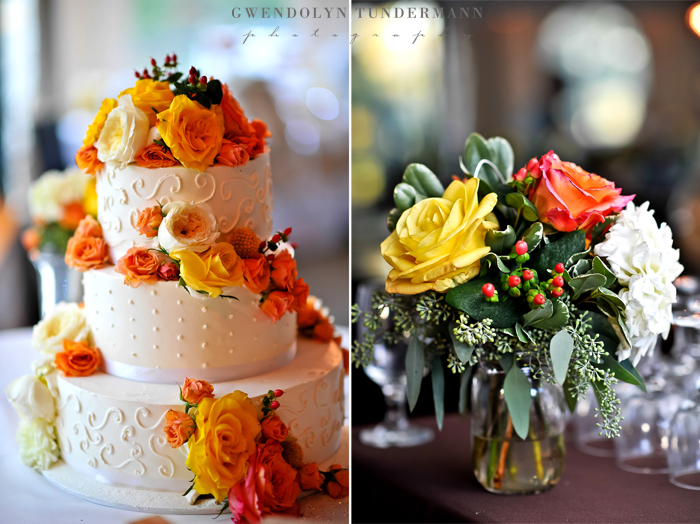 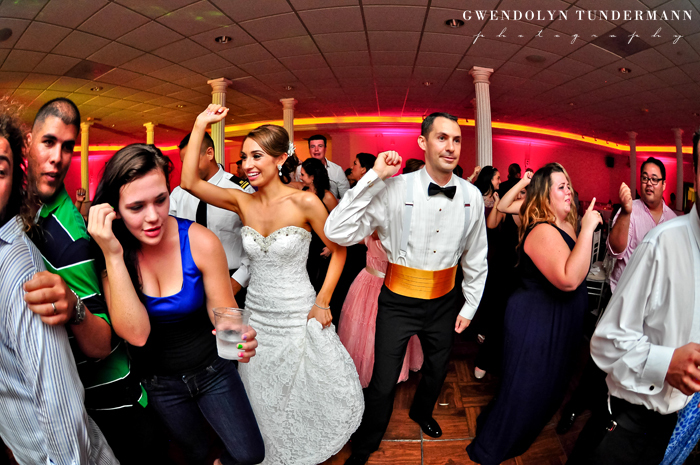 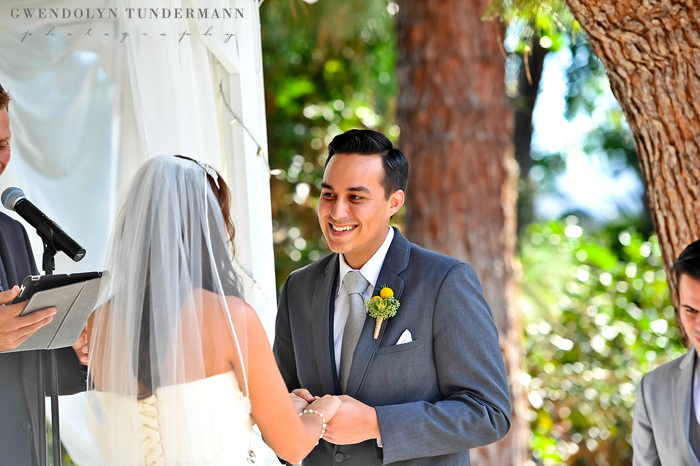 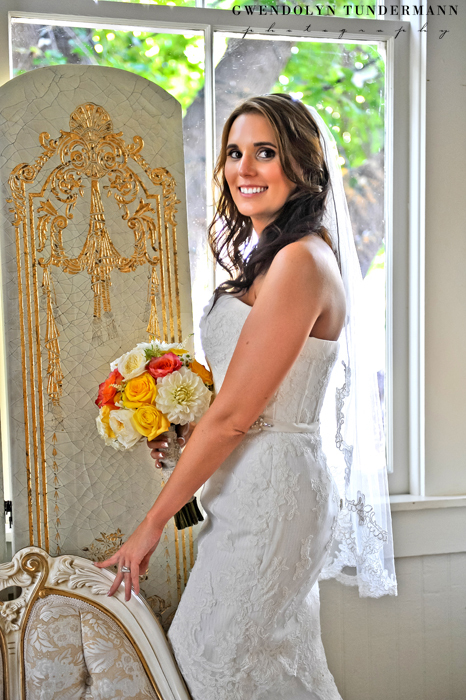 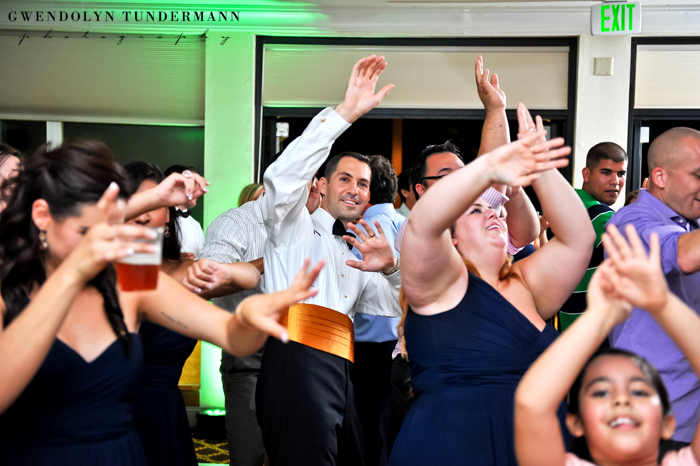 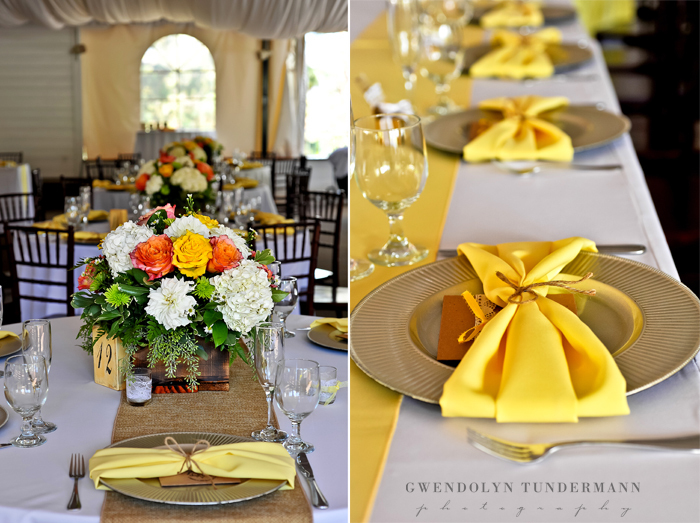 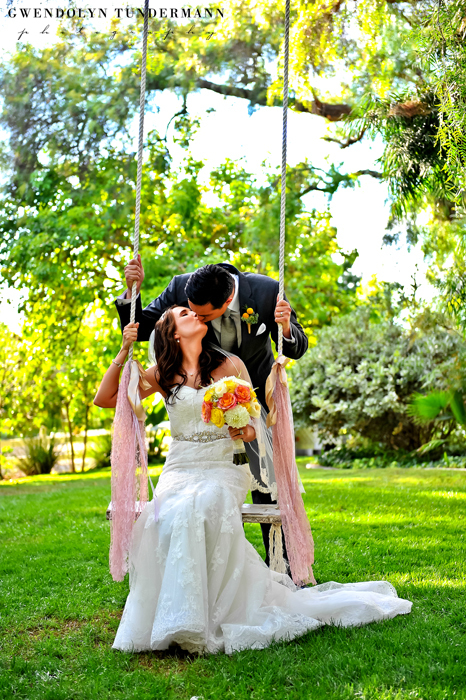 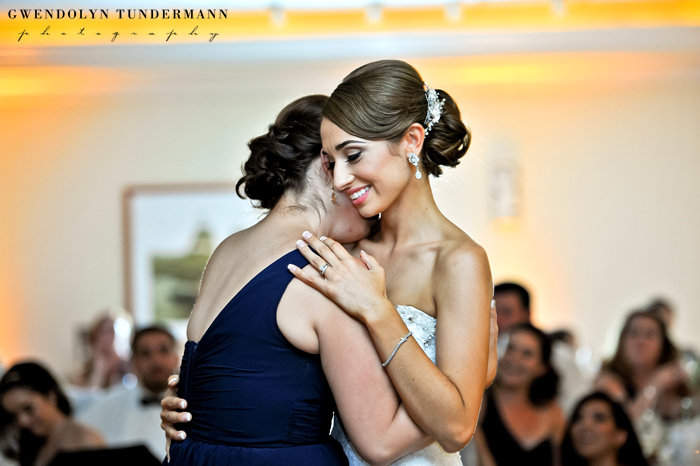 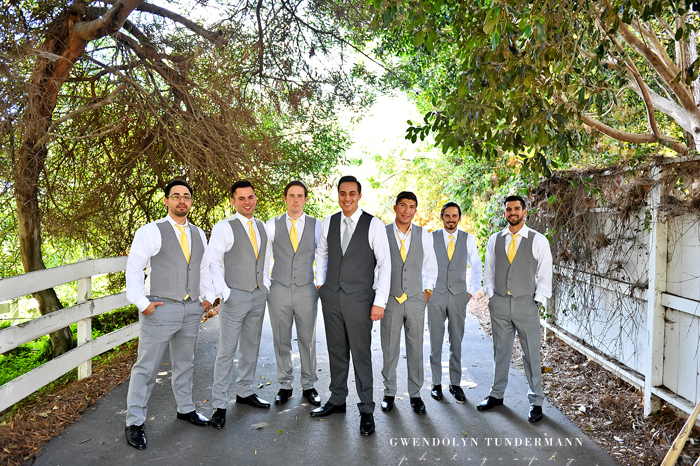 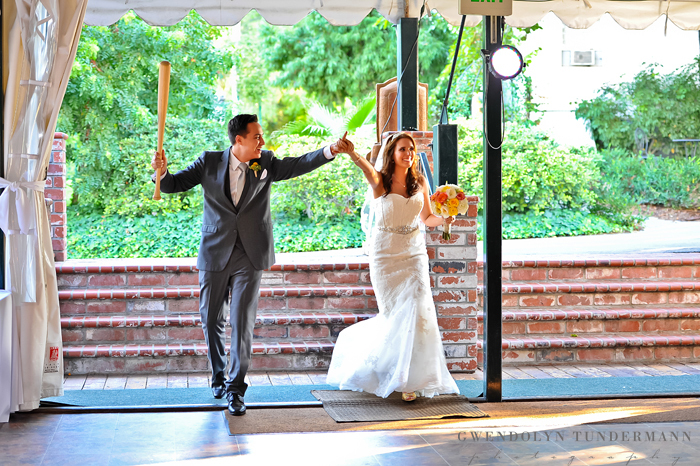 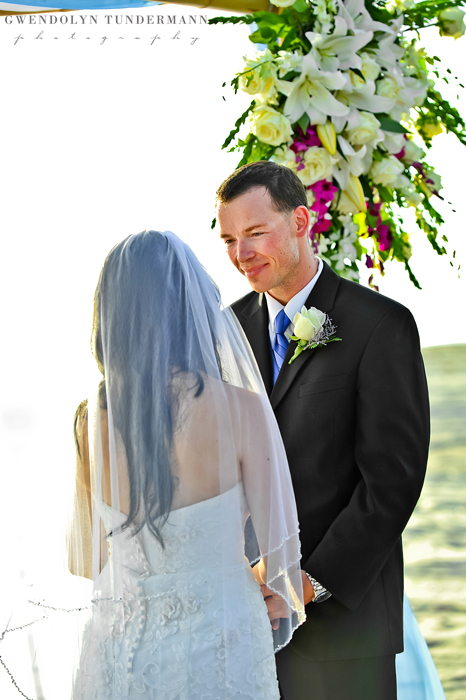 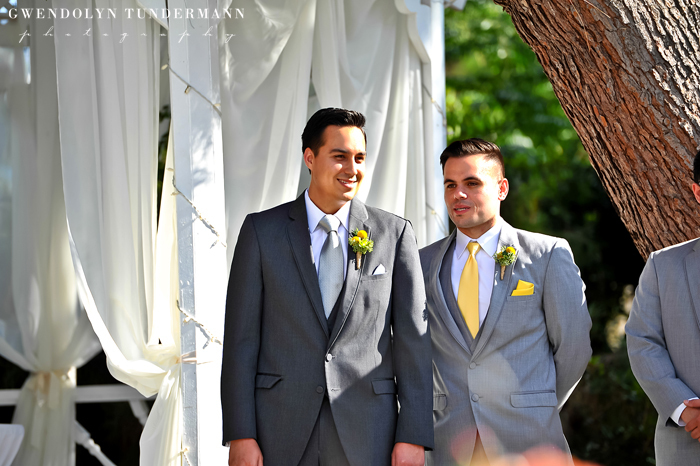 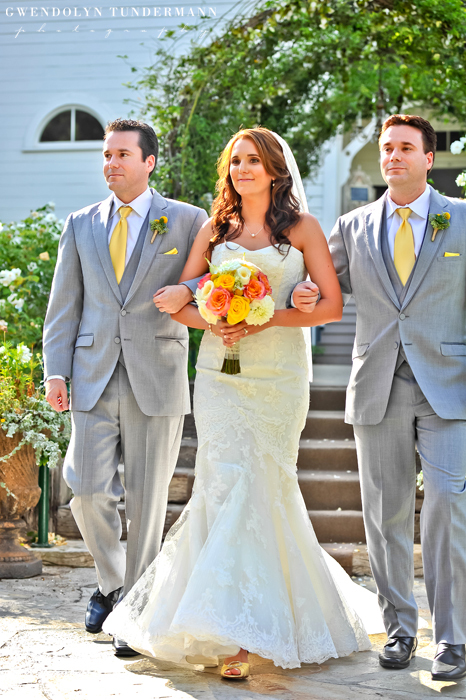 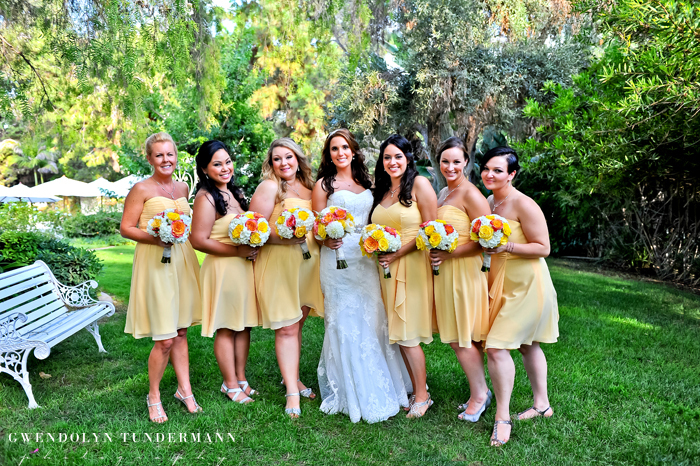 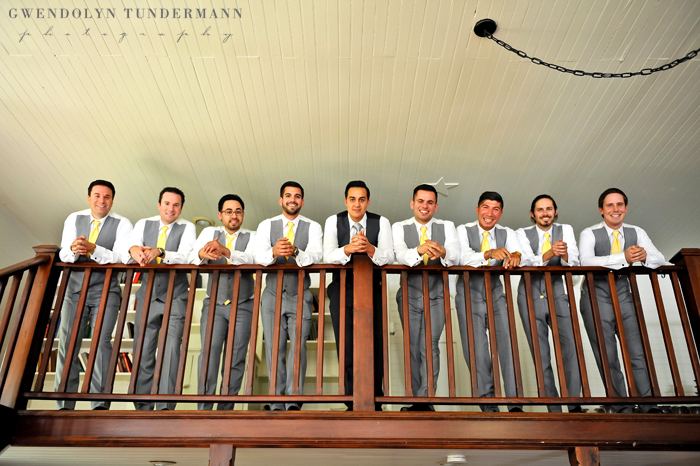 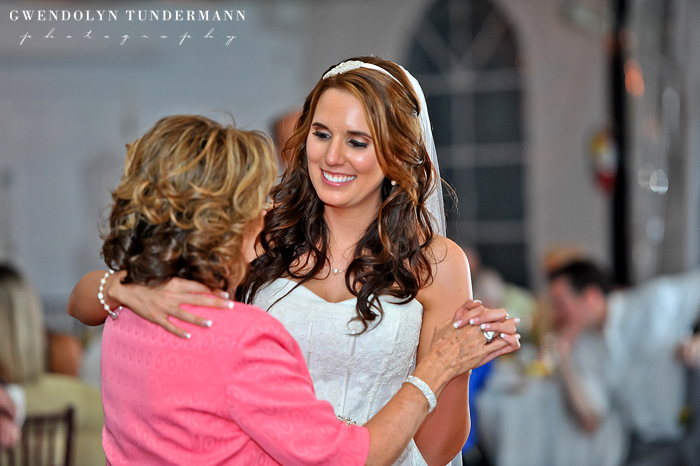 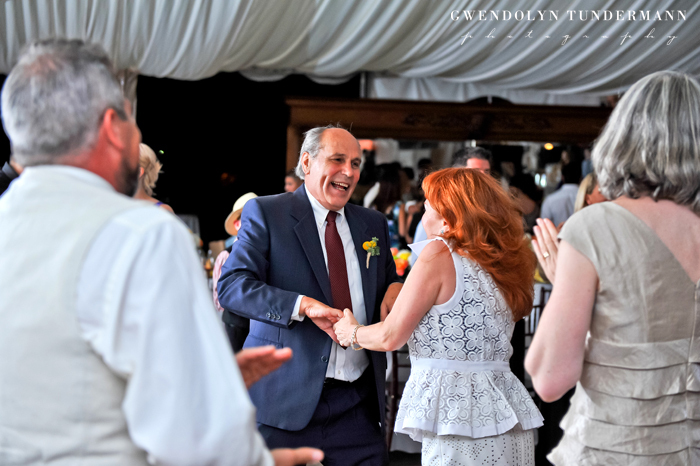 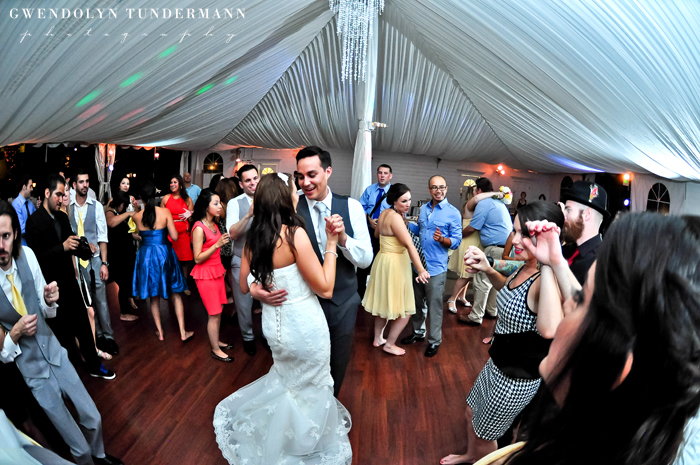 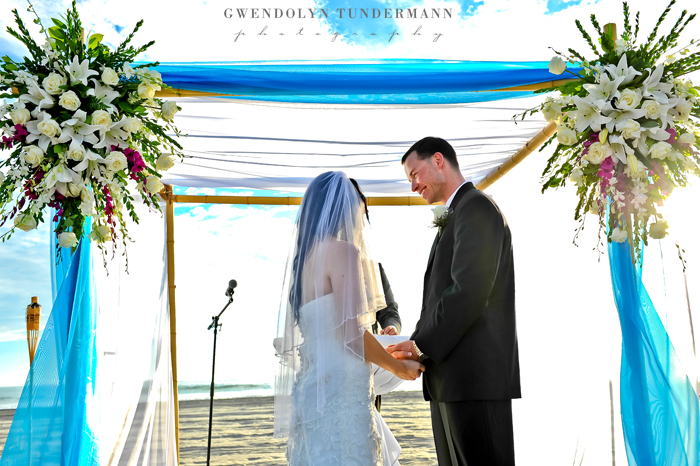 Like the bright and cheery colors they chose for their wedding, their ceremony was also very upbeat. 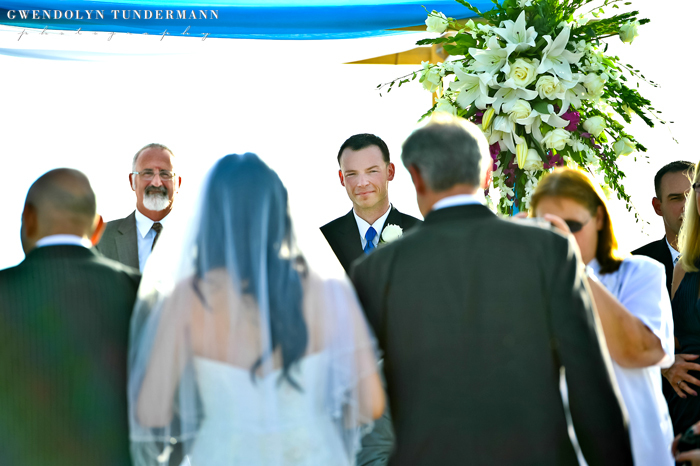 The officiant spoke to both of them prior to the wedding day and found out how they met and what they loved about each other. 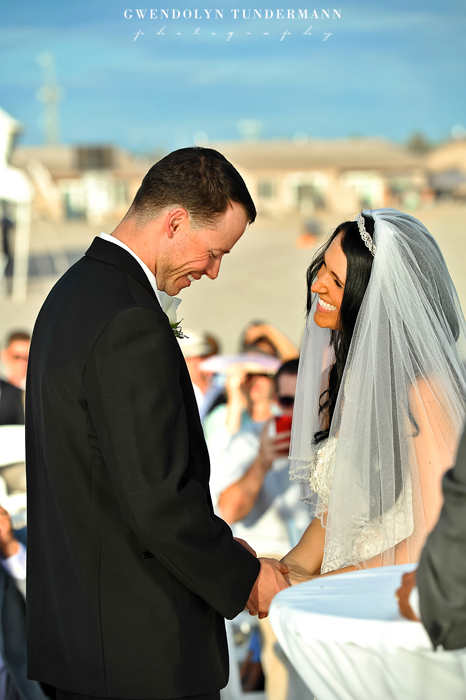 He shared their story with everyone gathered there, first about the humorous parts of the beginning of their relationship and then how they grew to love each other so much. 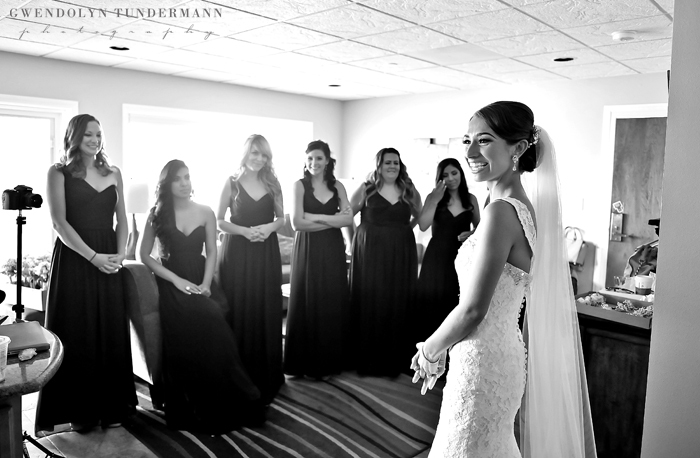 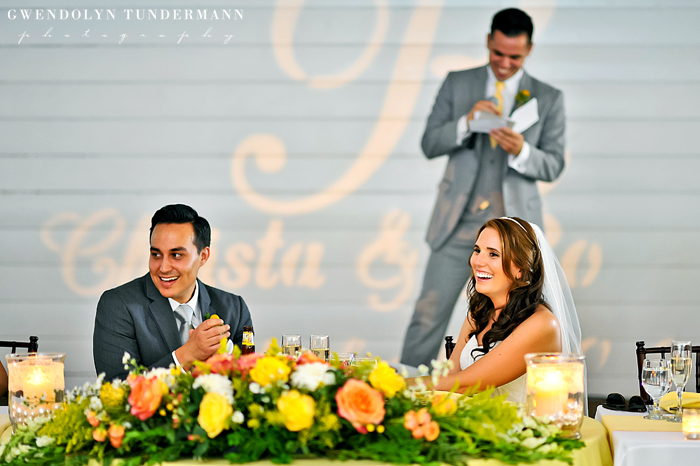 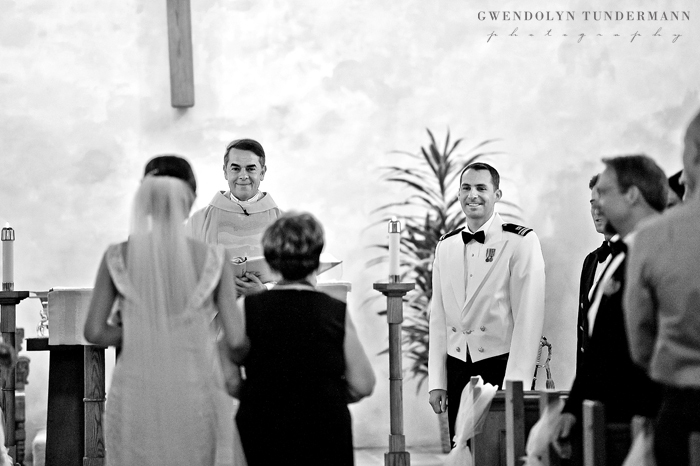 Watching Christa & Roberto throughout the ceremony, neither one of them could hide the pure happiness they felt. 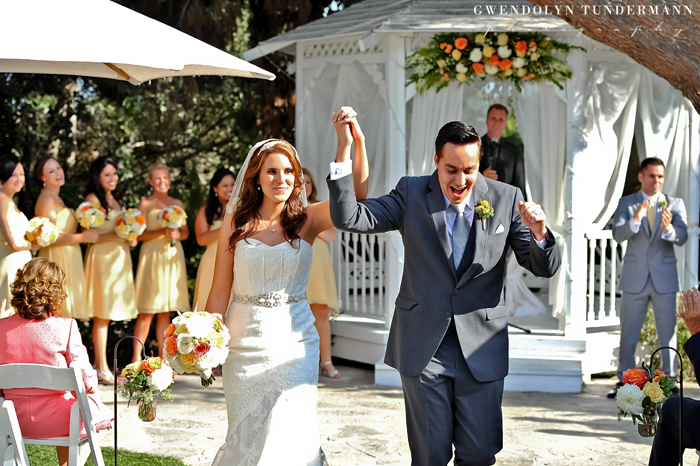 They were all smiles as they held hands under the garden gazebo! 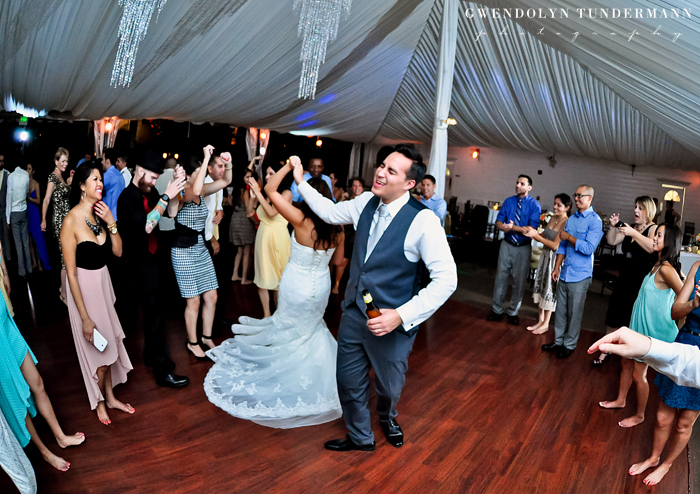 Following the ceremony, it was time to party! 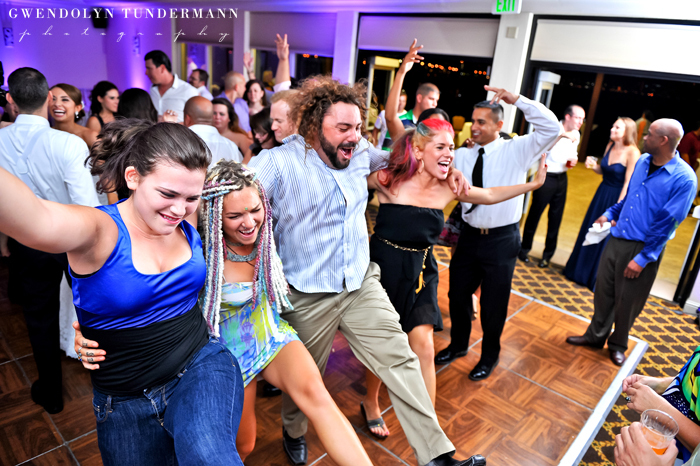 And let me tell you – their friends really know how to have a good time! 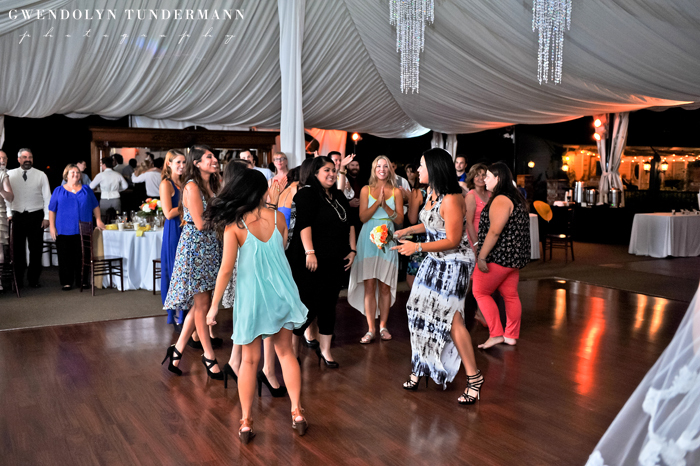 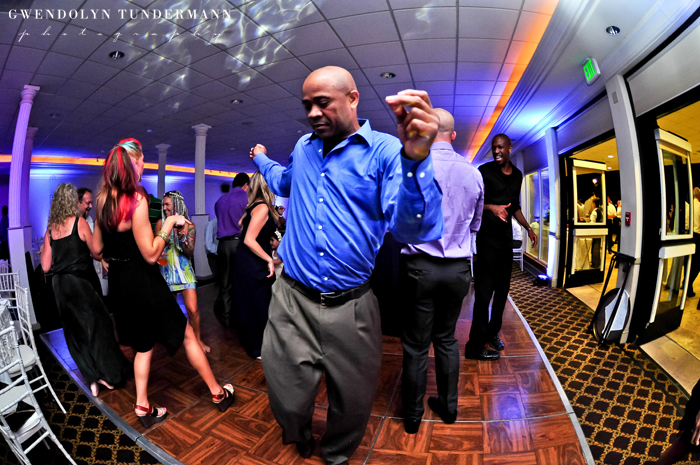 They were such a fun crowd and kept the dance floor packed all night! 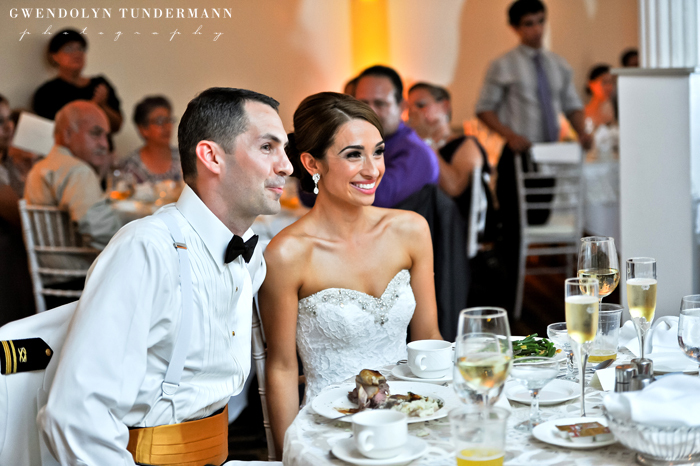 More stories were shared about this amazing couple (along with many more laughs and tearful moments) during the speeches. 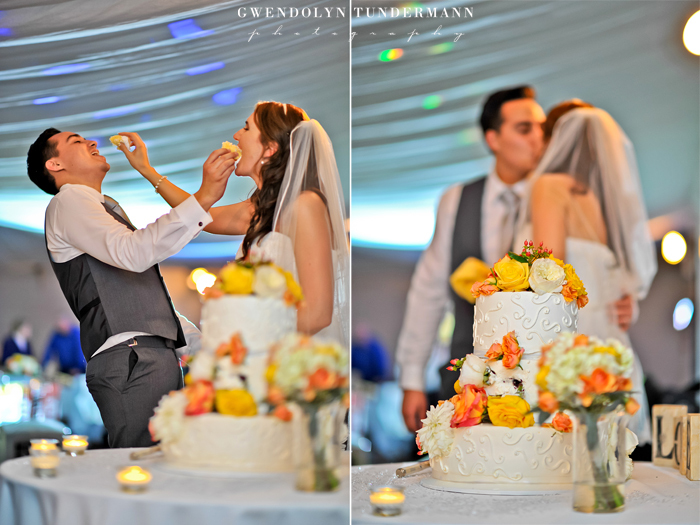 When the time came to cut the cake, they got a little messy but laughed the whole time and ended with the sweetest kiss! 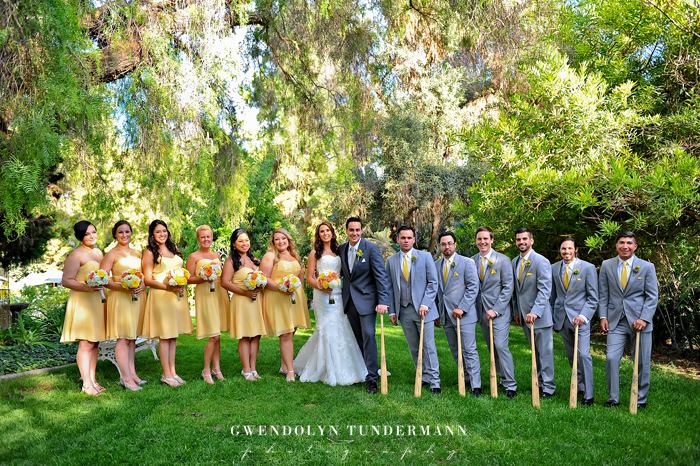 Everything about this wedding just makes me smile! 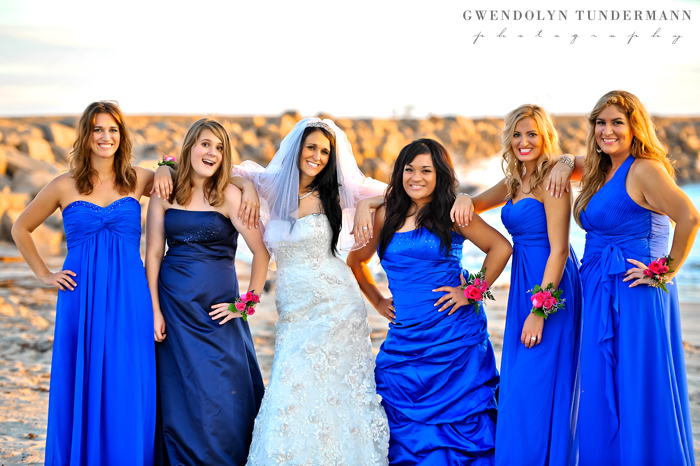 It was one of those perfect days from start to finish, and so vibrant and colorful and beautiful! 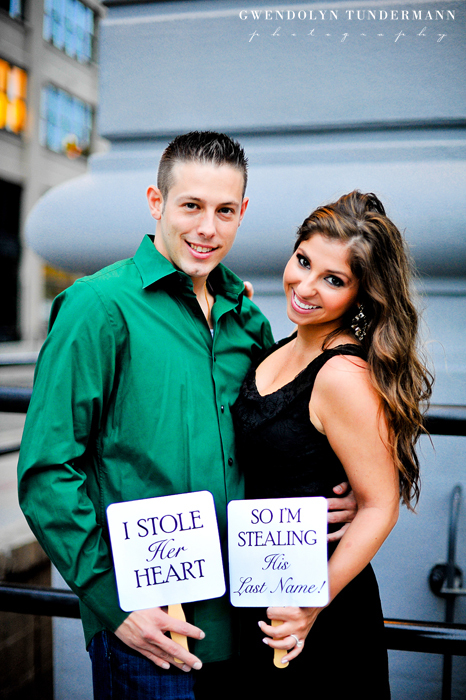 Plus they are such a happy and adorable couple! 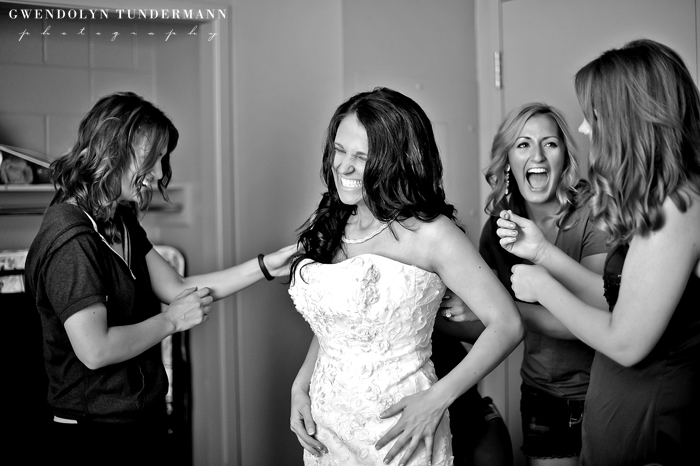 How can you not be happy around two people so in love! 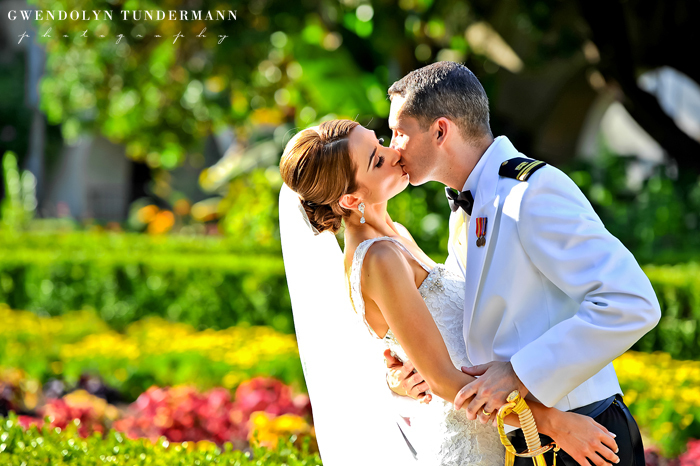 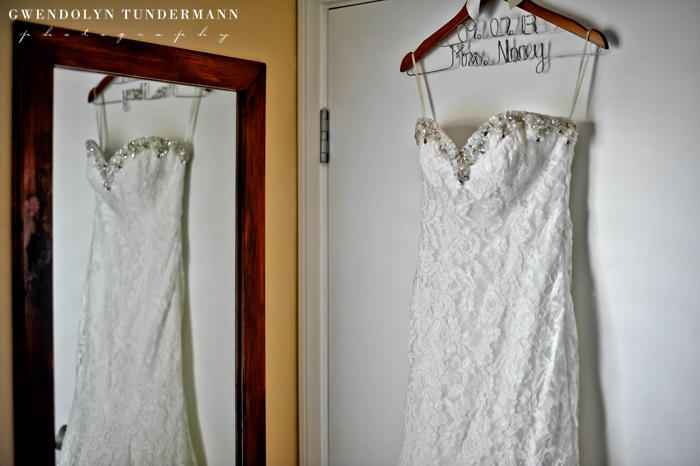 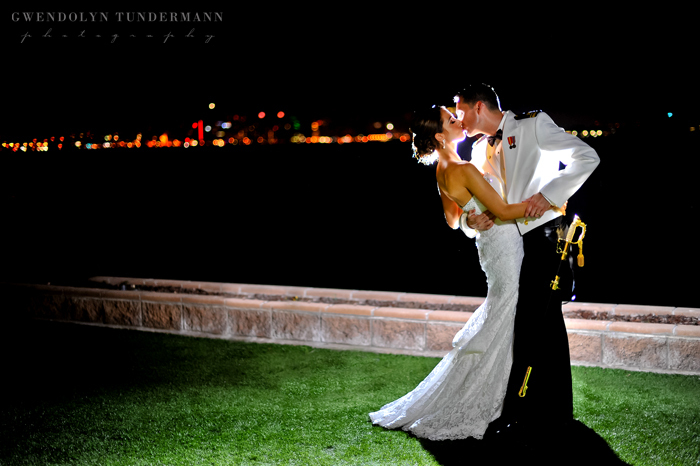 We hope that their wedding photos brighten your day as well! 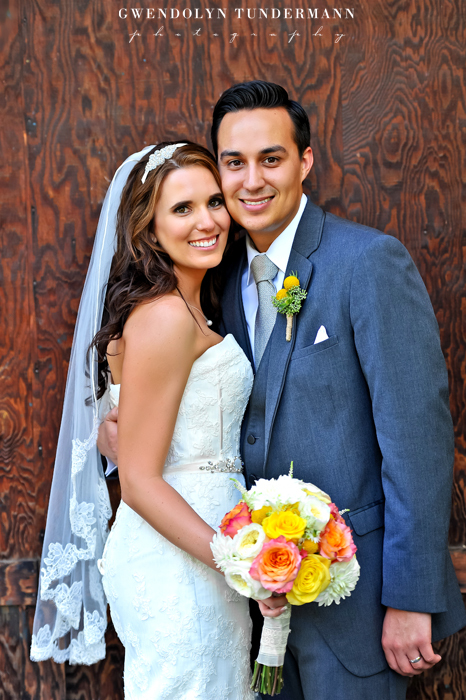 Congratulations Christa & Roberto! 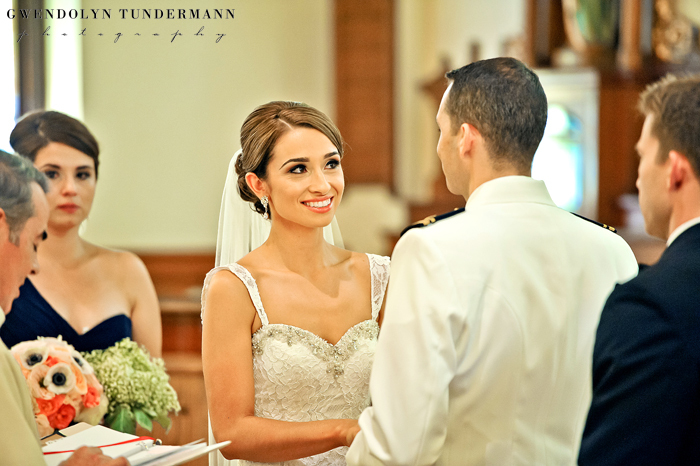 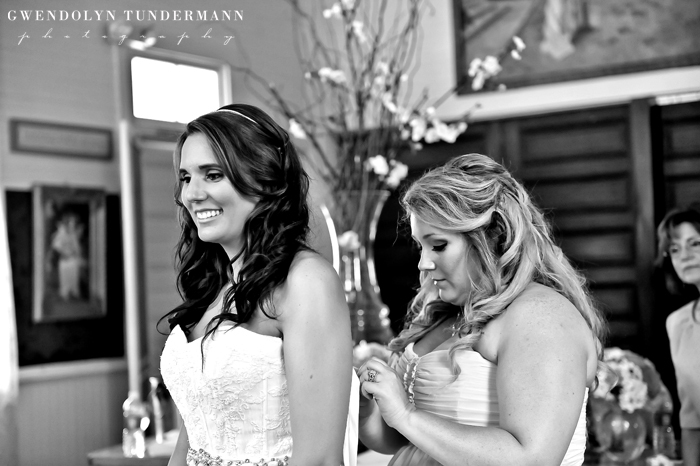 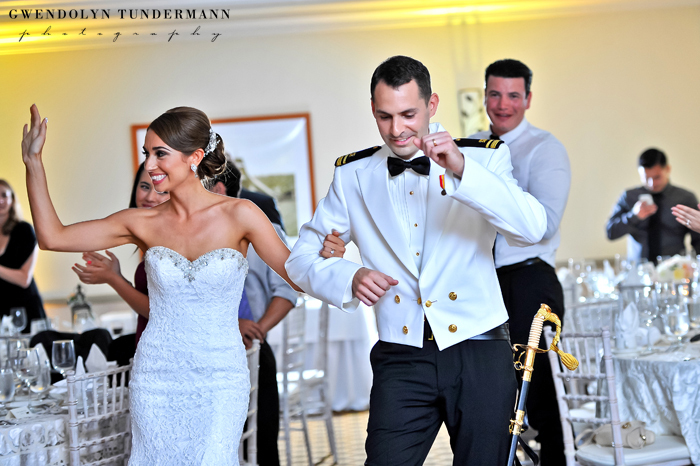 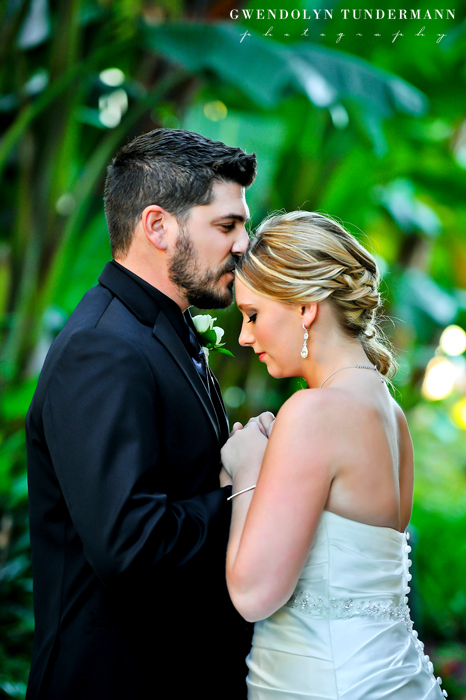 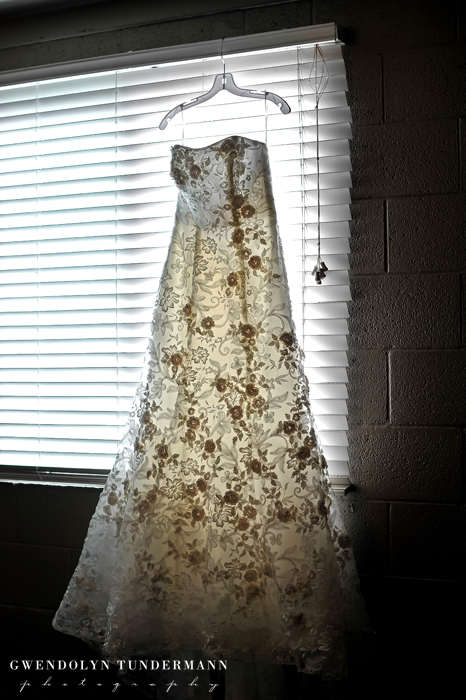 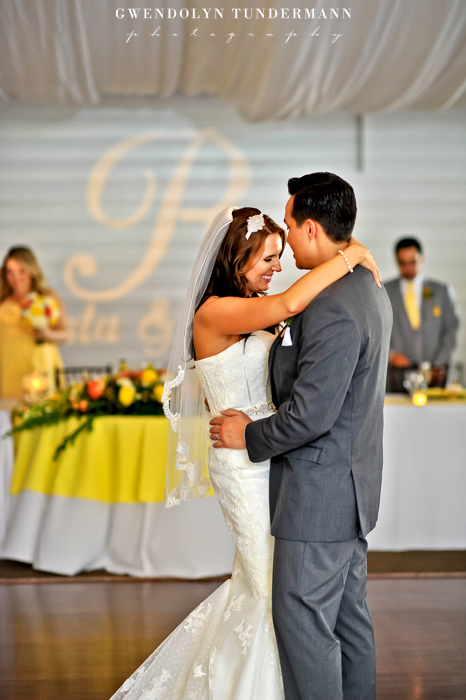 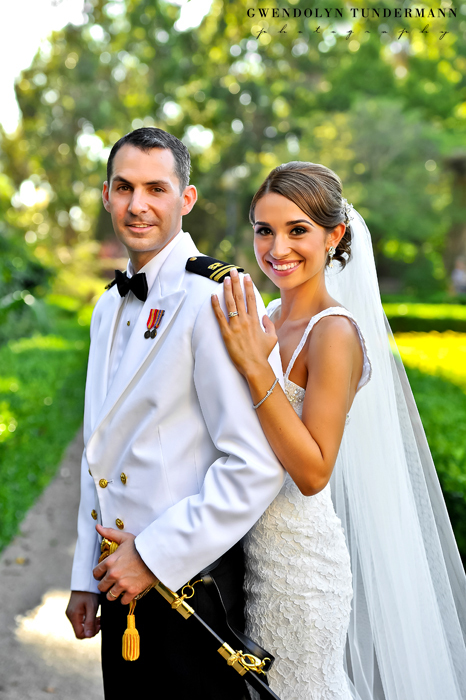 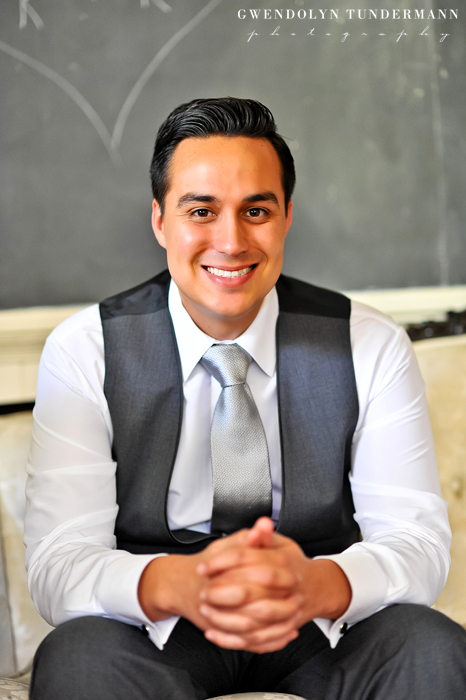 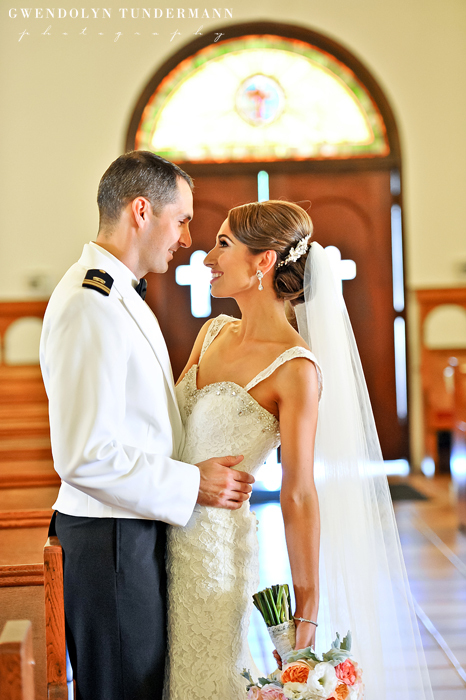 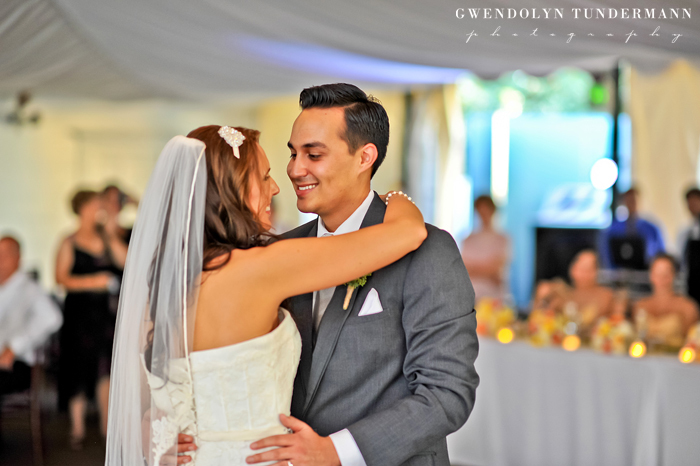 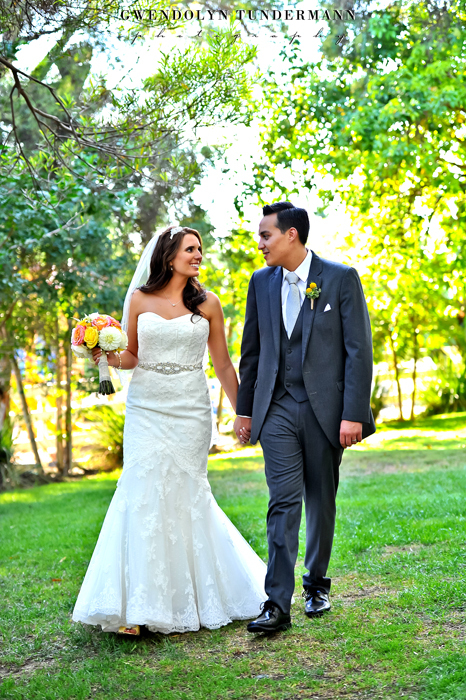 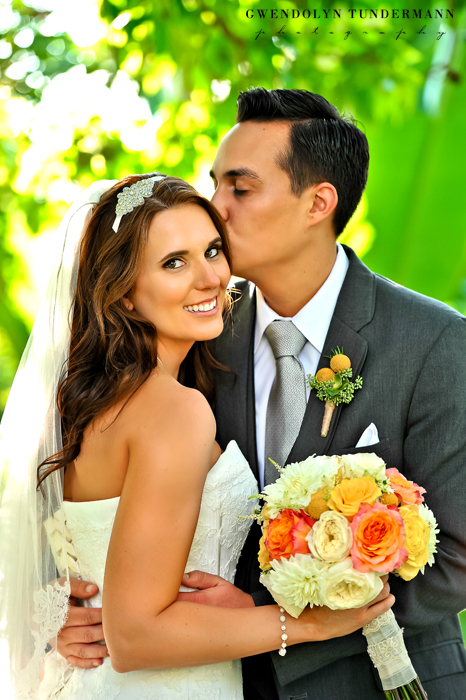 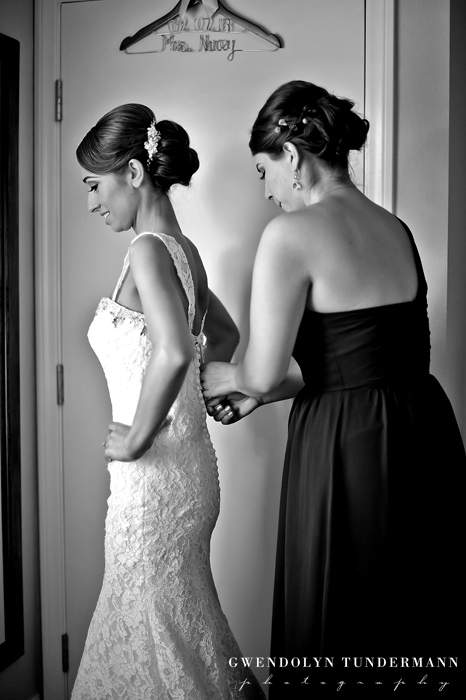 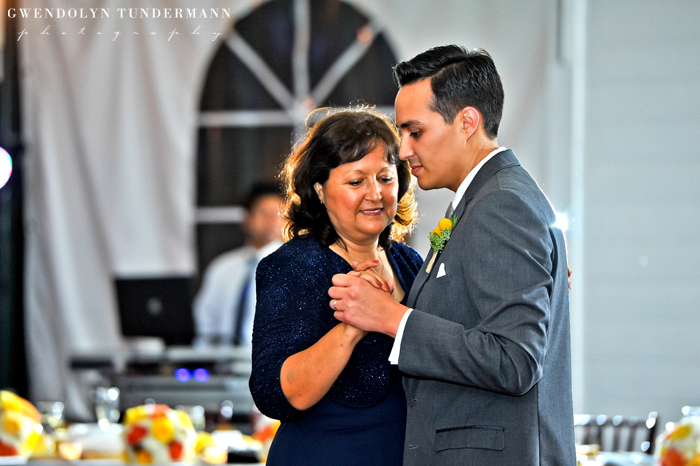 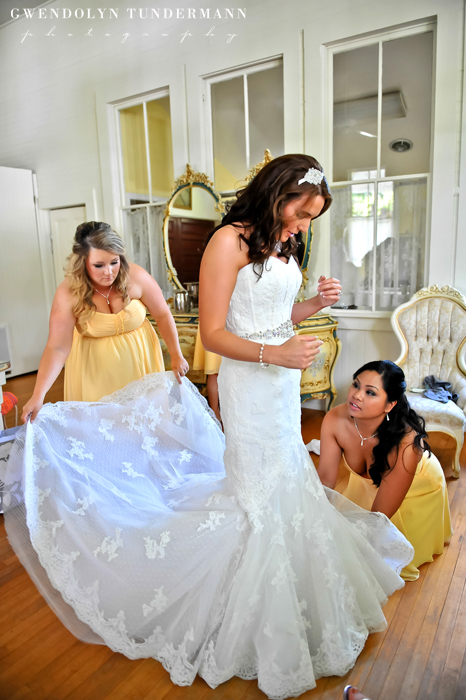 We hope you enjoy Christa & Roberto’s wedding slideshow! 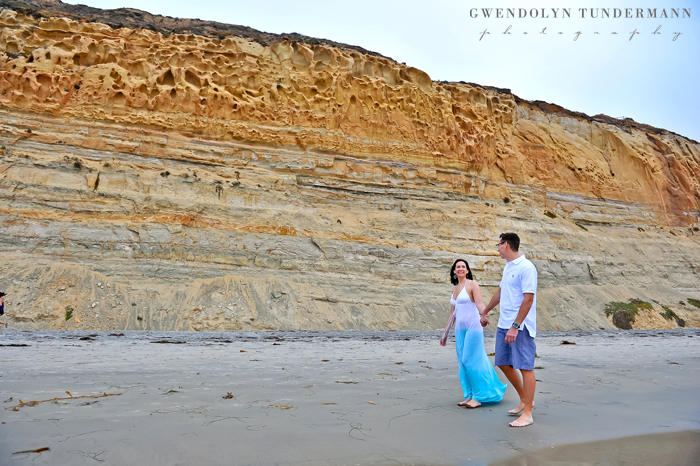 We had a fun time with Karen & Nathan the other night shooting their engagement photos at Torrey Pines State Park! 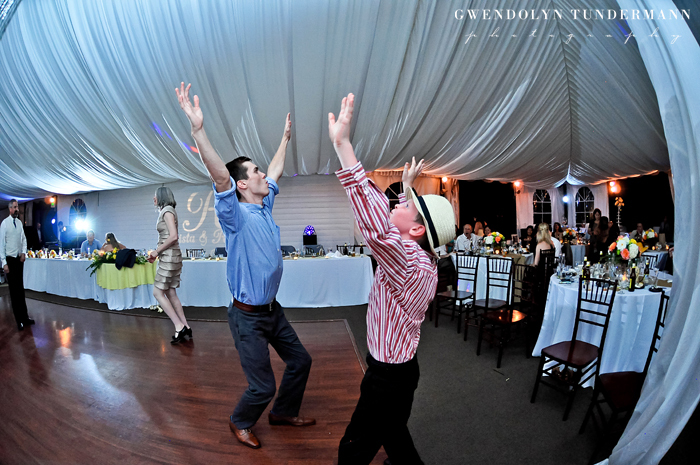 I laughed so much that my cheeks were literally hurting when we were done. 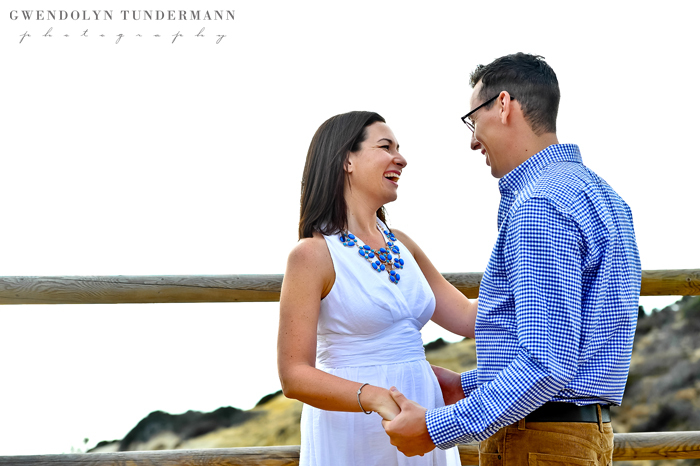 They both have a great sense of humor and are so outgoing – it’s hard not to have fun with them! 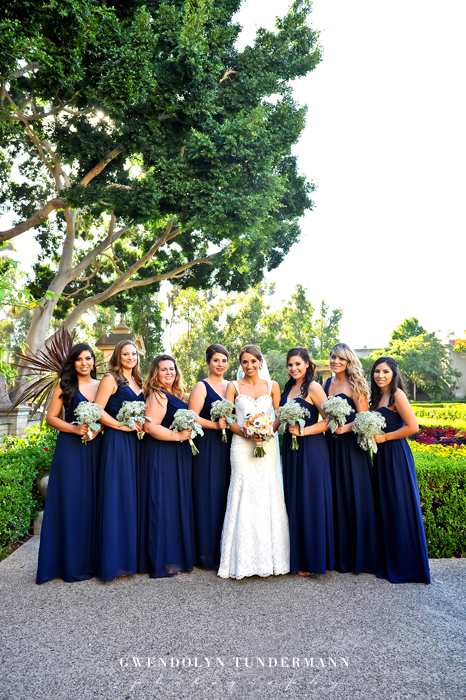 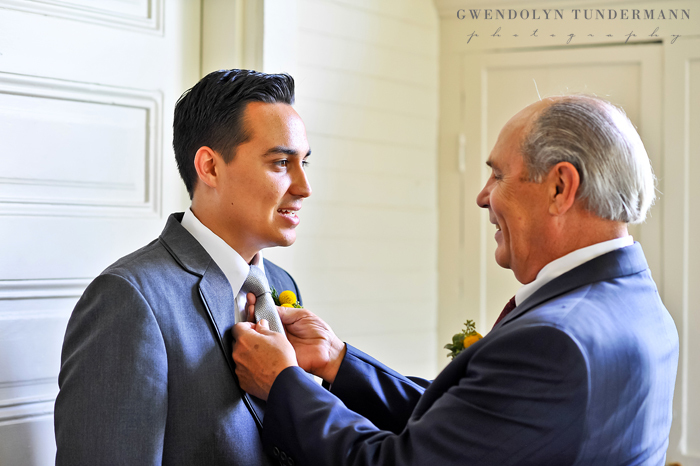 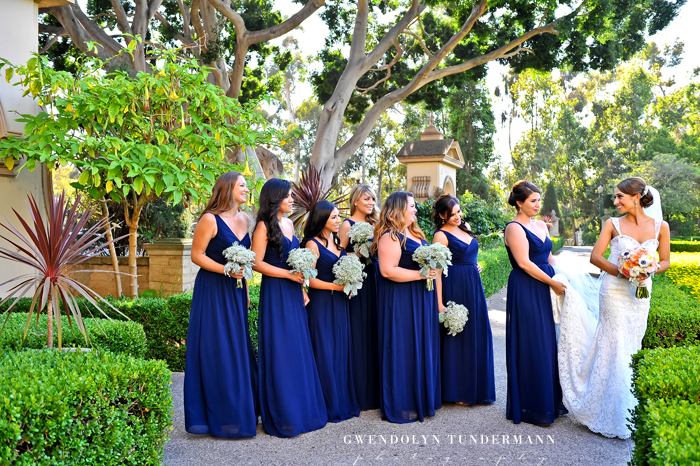 Yesterday, we shared Carolyn & Patrick’s beautiful wedding at Immaculate Conception Church in Old Town San Diego along with their wedding photos at Balboa Park. 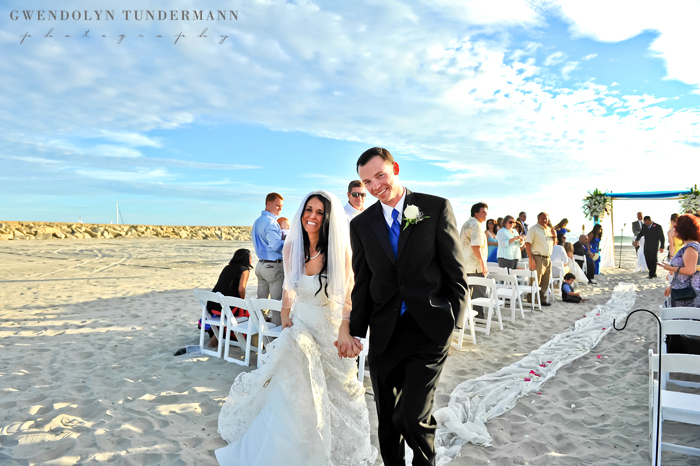 We showed you how beautiful their wedding was, and today we’re going to show you much FUN it was! 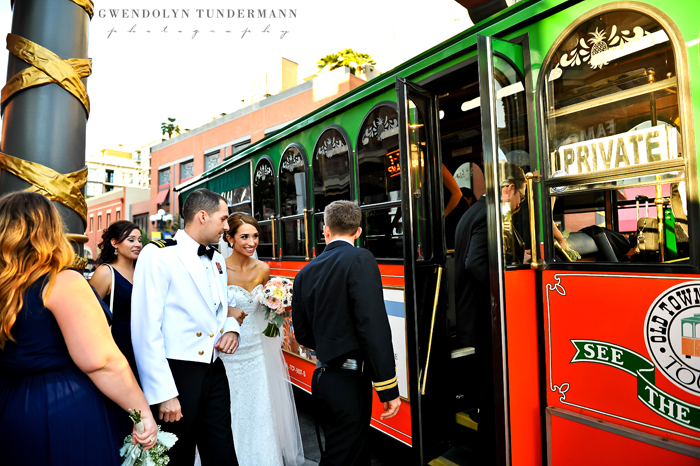 After Balboa Park, we hopped on the trolley for some wedding photos in the Gaslamp Quarter. 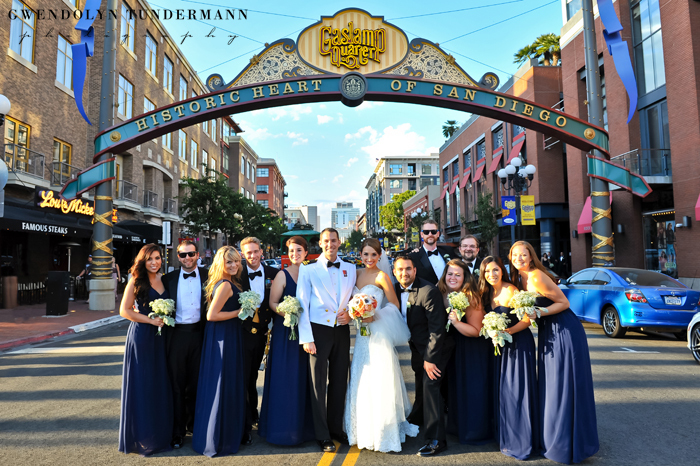 The traffic officers were super sweet and accommodated us while we caught a quick wedding party shot in front of the Gaslamp sign! 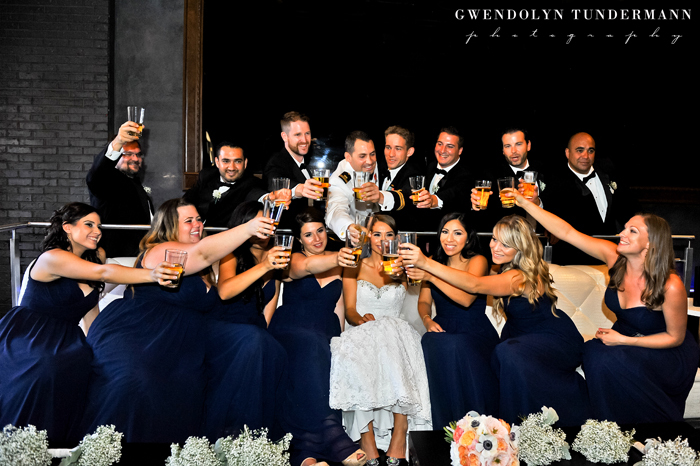 The wedding party relaxed for a while at the Hard Rock Hotel and toasted the bride and groom! 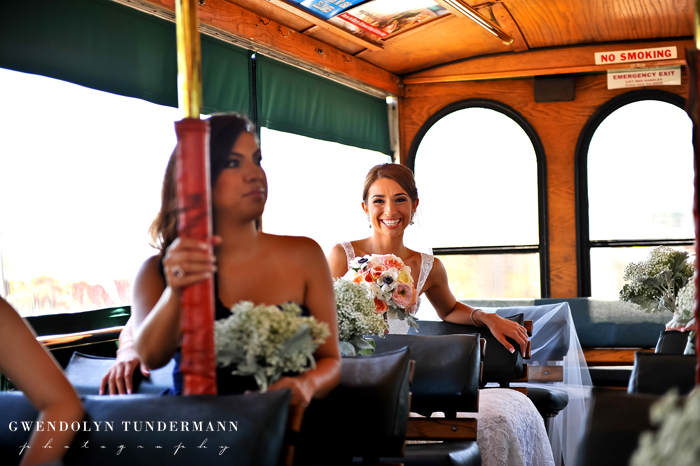 Soon it was time to board the trolley for one final ride to the reception. 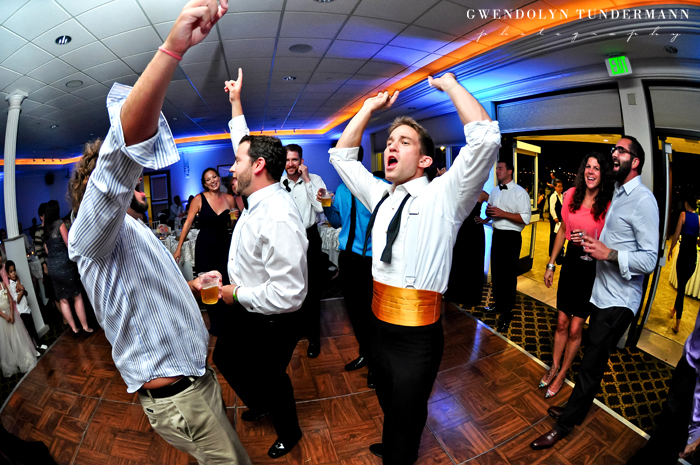 Music blaring, they sang their hearts out and got ready to party! 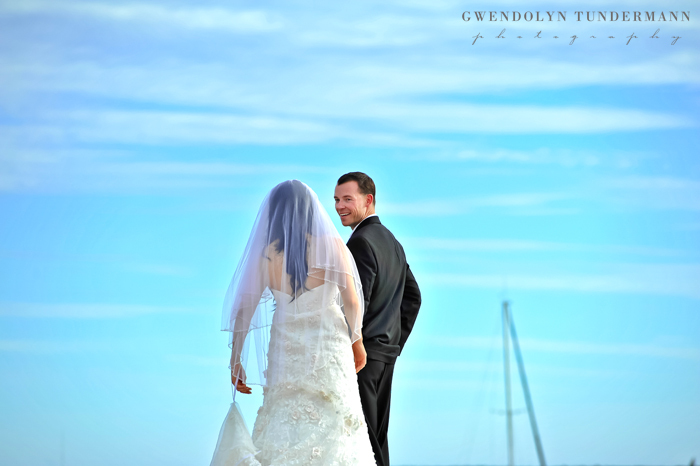 When we arrived for their reception at the Admiral Kidd Conference Center, there was a cool breeze coming in over the water. 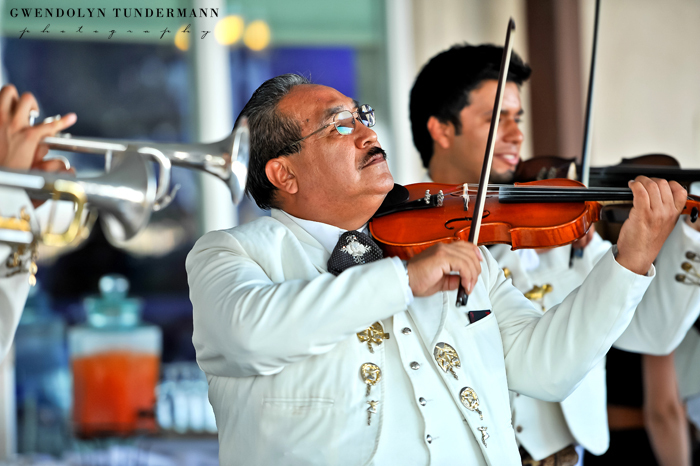 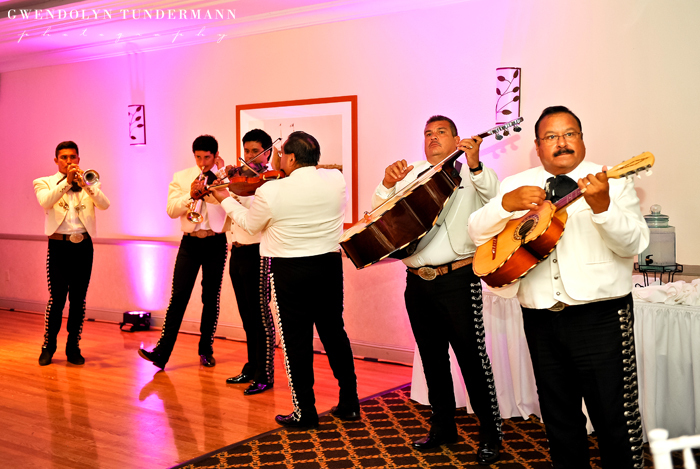 A mariachi band was playing for the guests during cocktail hour, and when they moved inside the guests joined them. 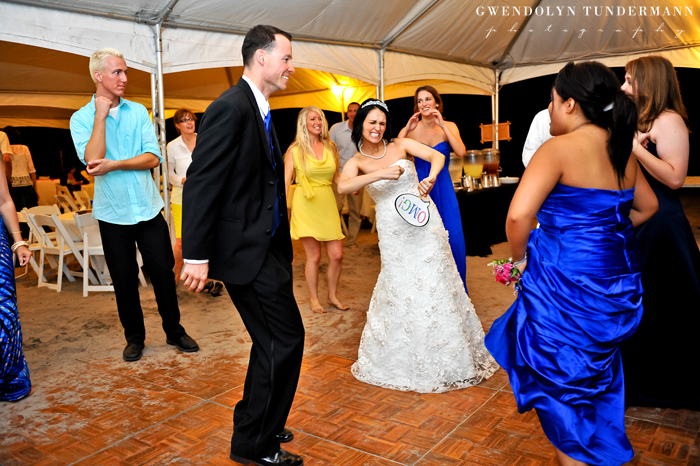 Everyone was introduced and Carolyn & Patrick went into their first dance, showing us all some very impressive dance moves. 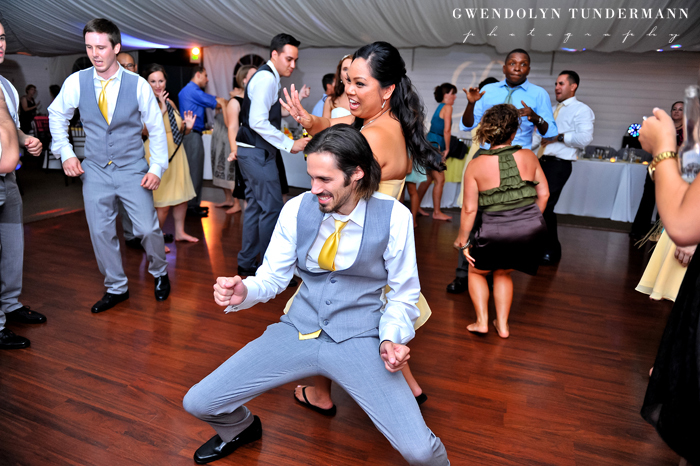 How about that dip?! 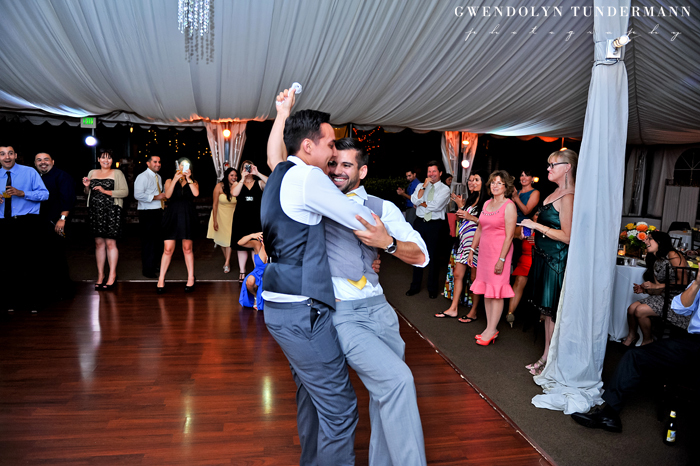 It was like watching Dancing with the Stars! 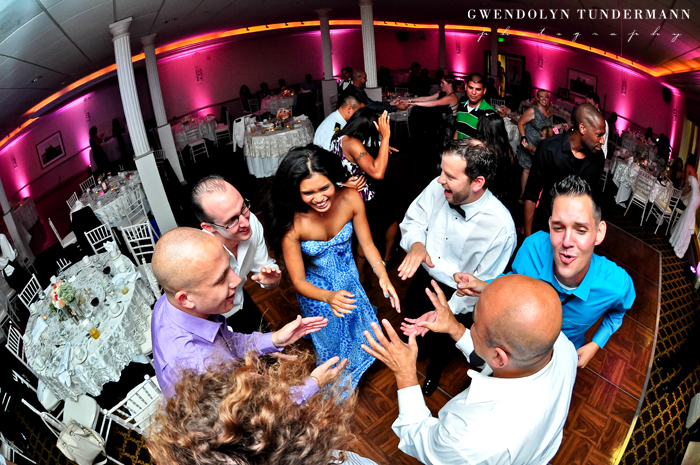 There was tons more dancing throughout the night! 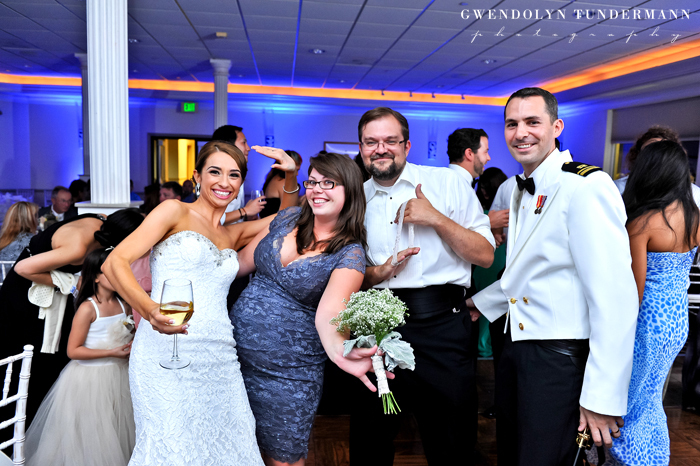 Everyone had such a great time! 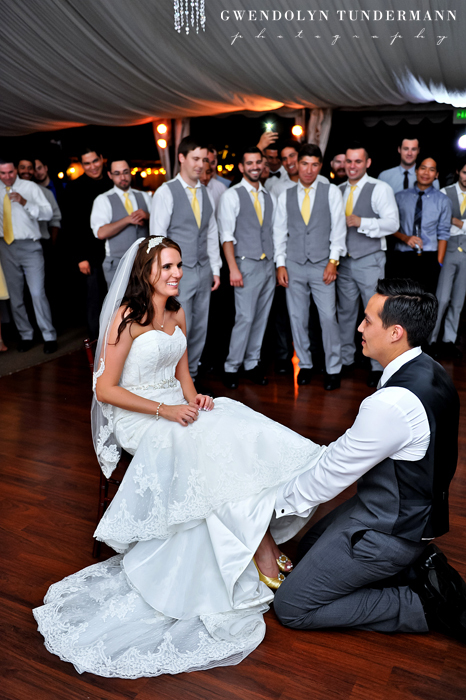 Patrick surprised everyone (especially Carolyn) when he went for the garter and seemed to find everything but the garter underneath her dress! 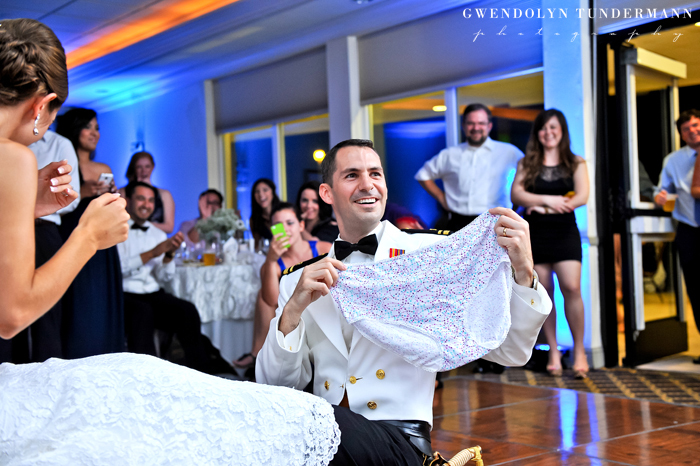 Fortunately, his bride has a great sense of humor! 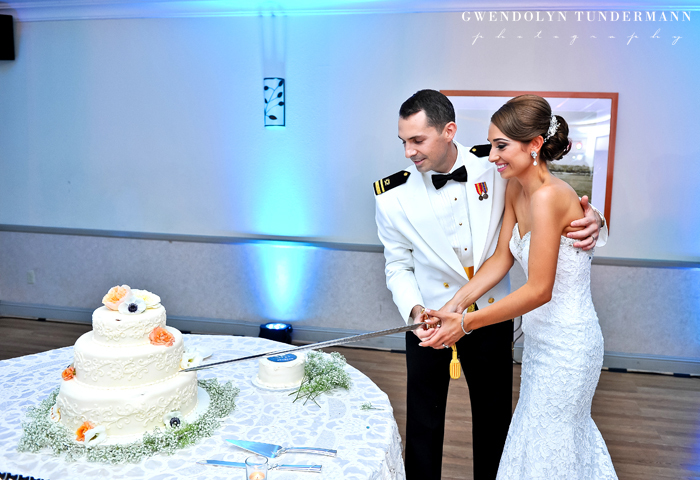 Another highlight of the evening was the cake cutting, which Carolyn & Patrick did with his sword. 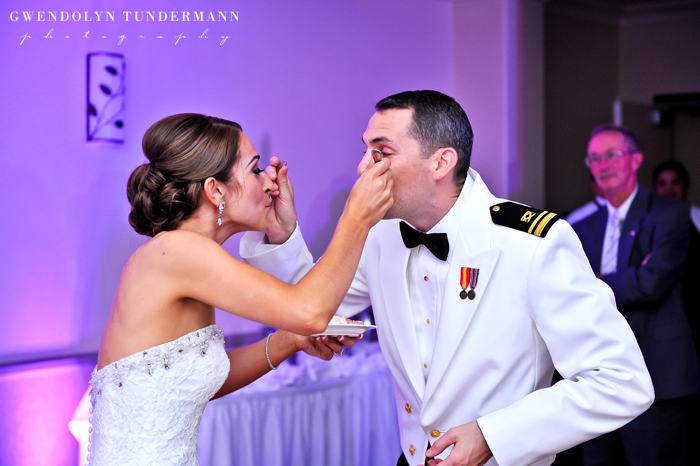 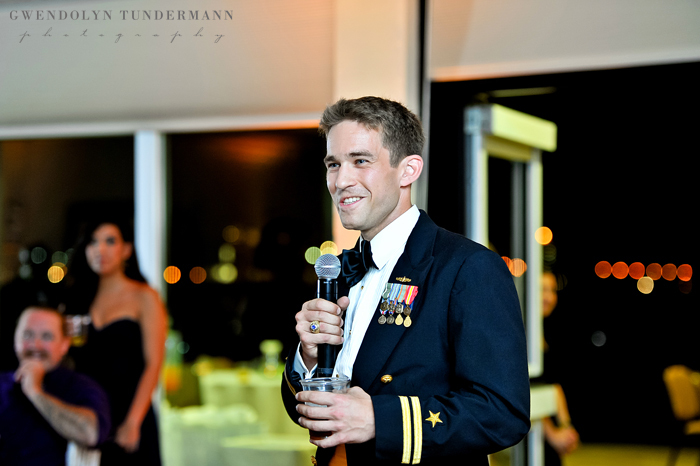 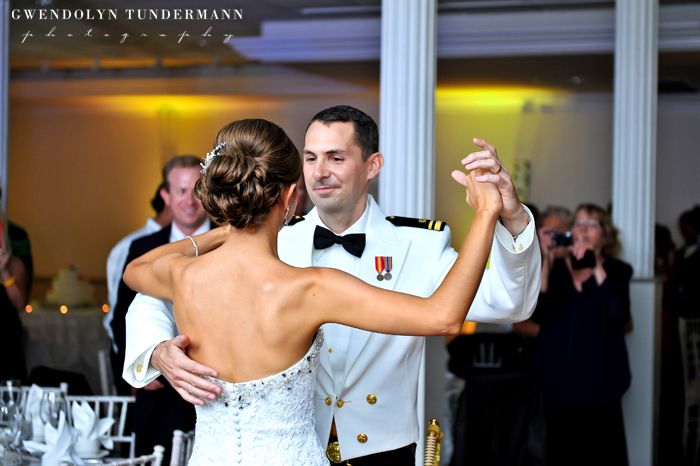 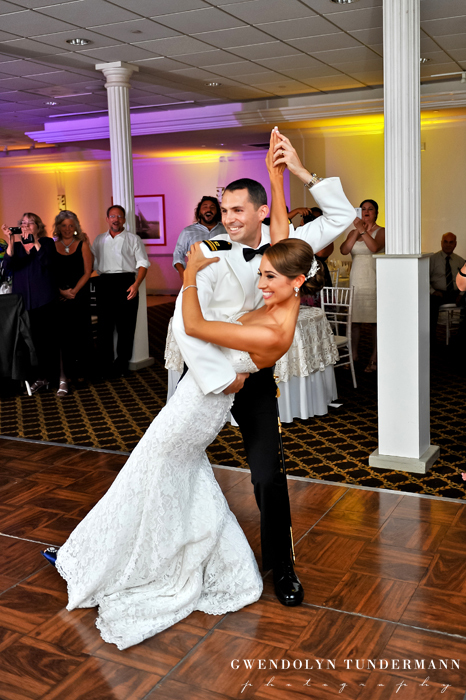 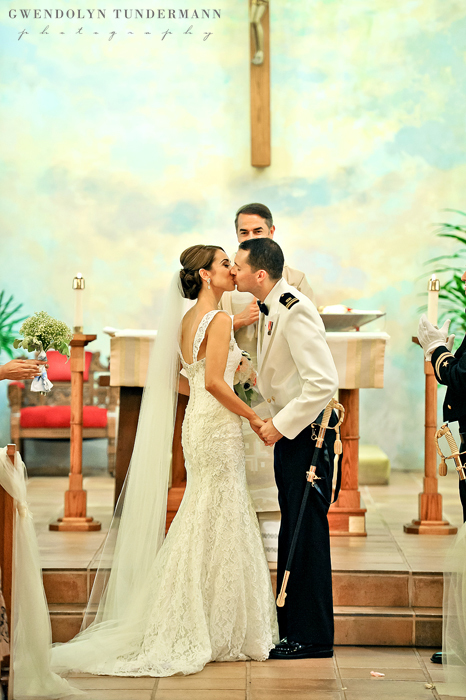 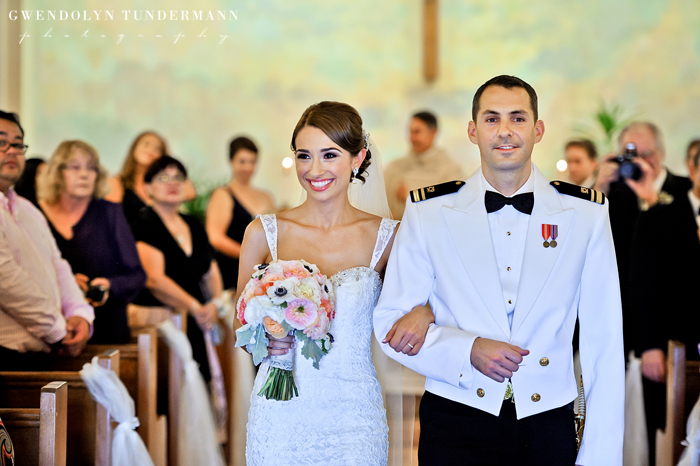 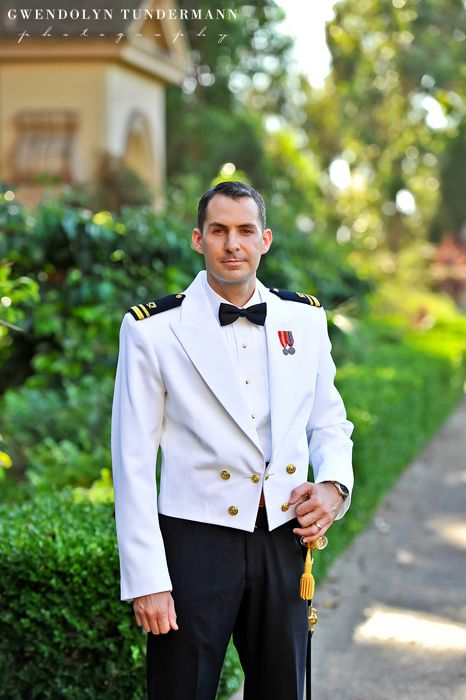 You gotta love a Navy wedding!! 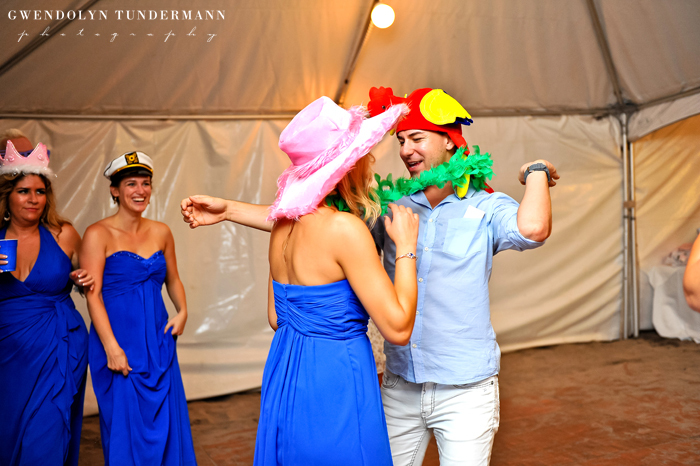 What a memorable and very fun evening! 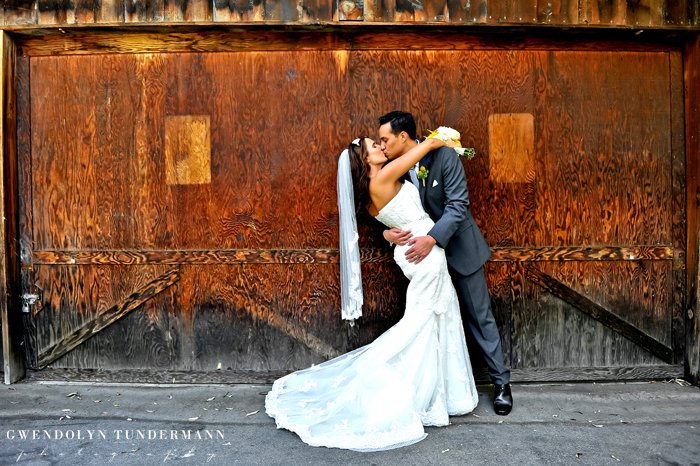 The whole day was wonderful from start to finish, and we couldn’t have had a sweeter couple! 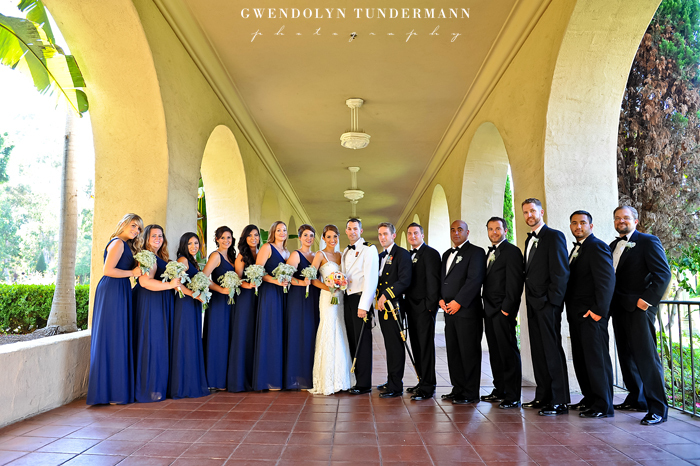 Congrats Carolyn & Patrick! 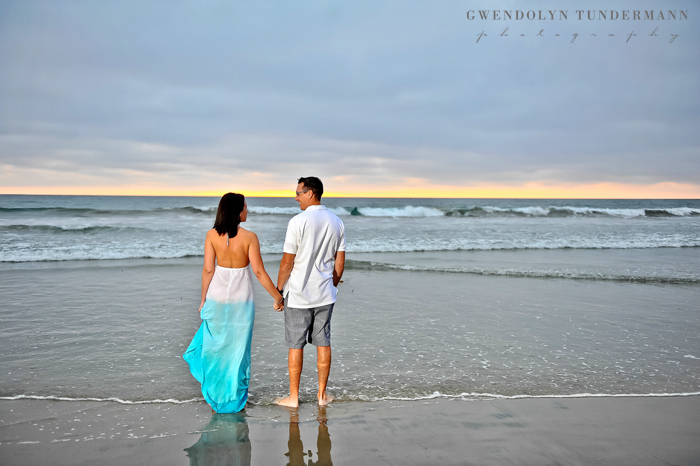 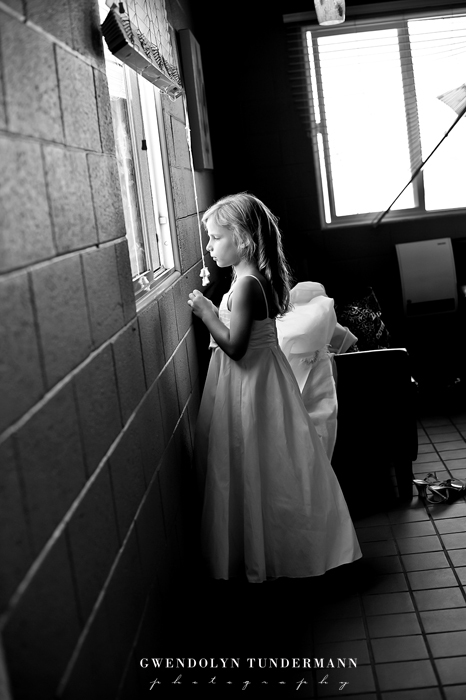 When we moved to California, there were two places on my wish list to shoot. 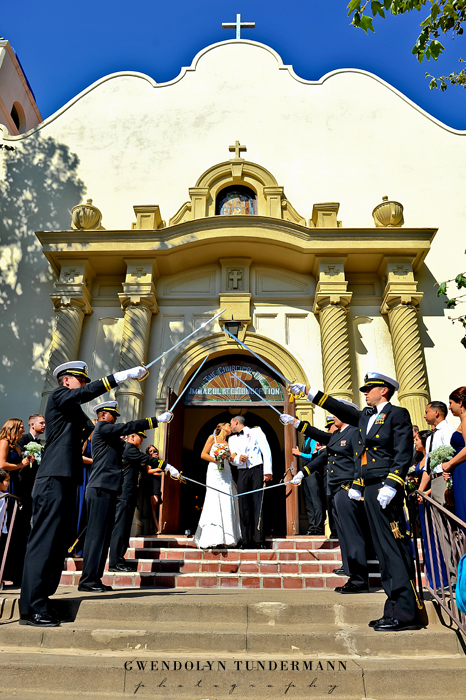 One of them was Immaculate Conception Catholic Church in Old Town San Diego. 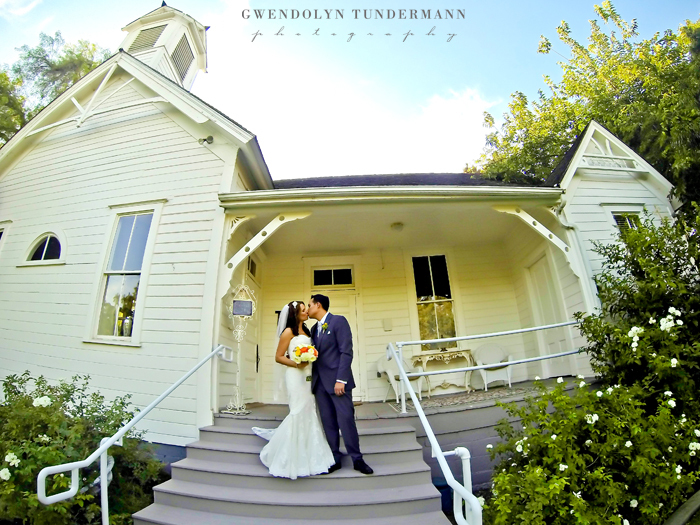 The charming historic church is iconic California in my opinion. 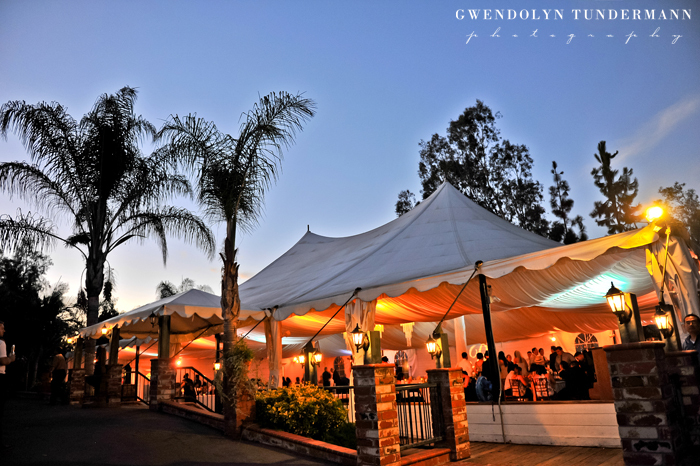 I always loved this little church whenever I saw it on my visits to California. 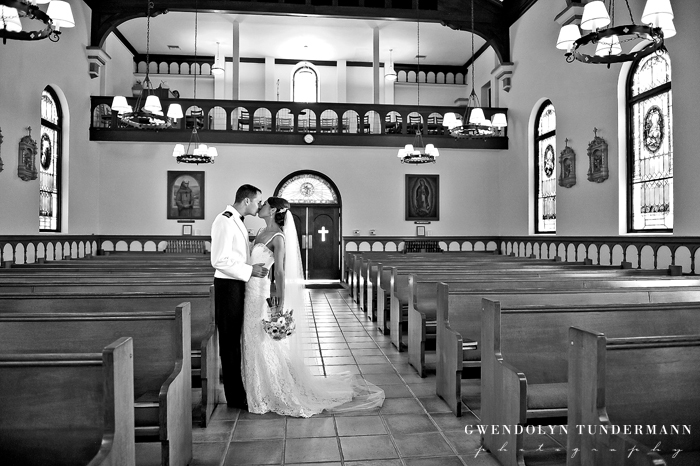 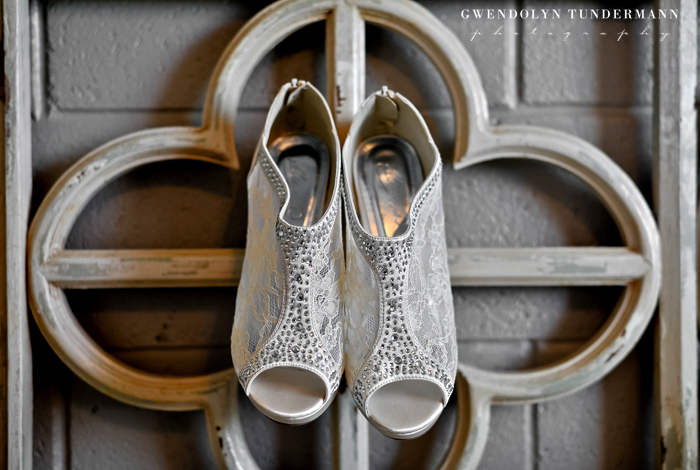 Though I had envisioned shooting a wedding in this sweet church, I could never have imagined something as beautiful as the storybook wedding of Carolyn & Patrick. 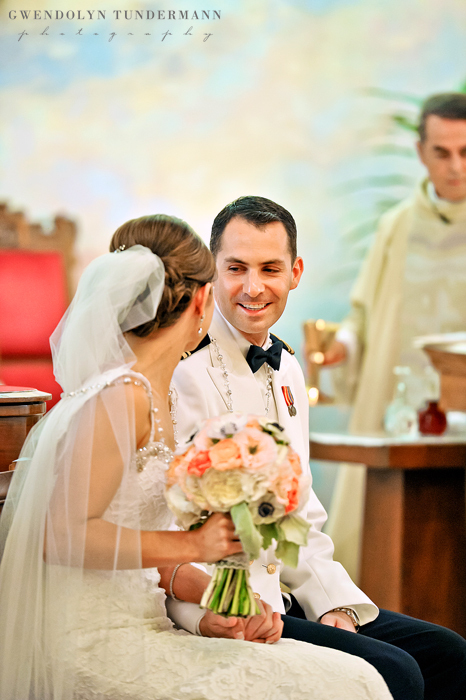 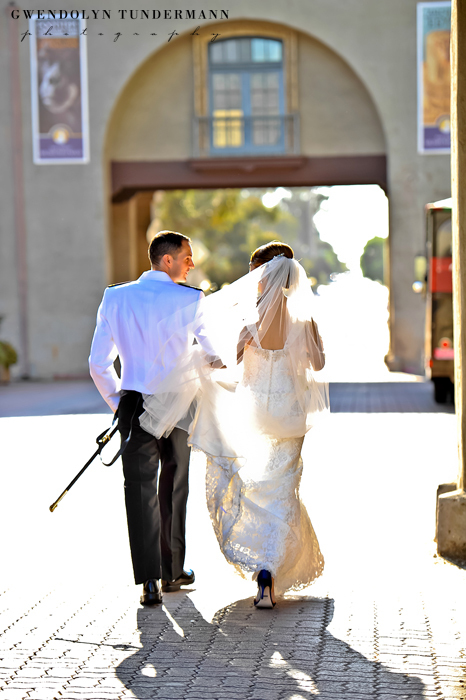 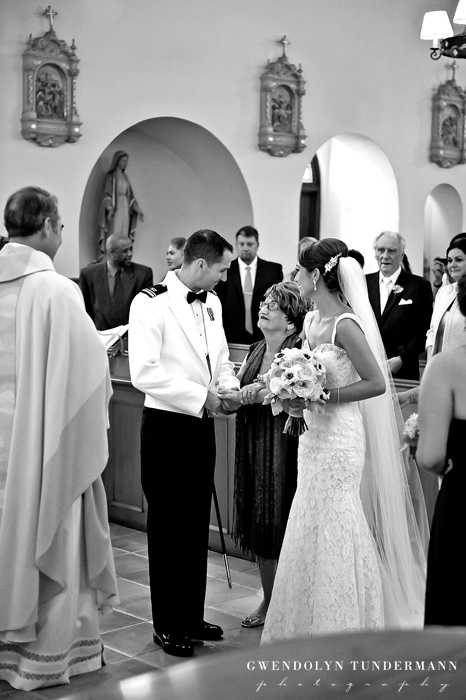 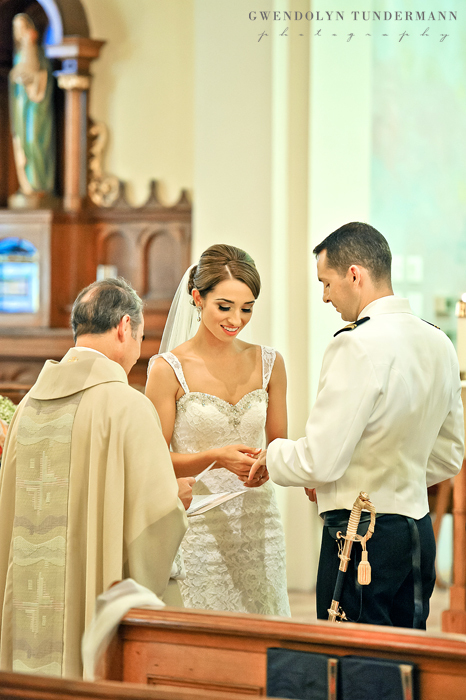 Their wedding at Immaculate Conception was filled with tender moments, reflections on their faith, and ended with them passing through a sword arch. 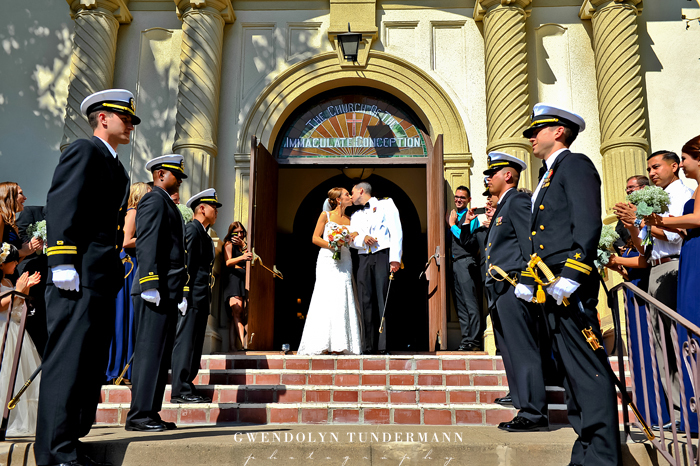 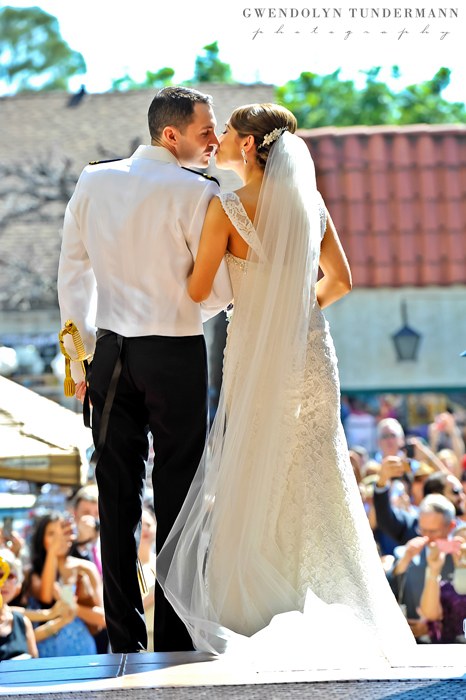 As their friends and family gathered outside the church awaiting their exit, crowds of visitors to Old Town also stopped to watch and cheer on the newlyweds! 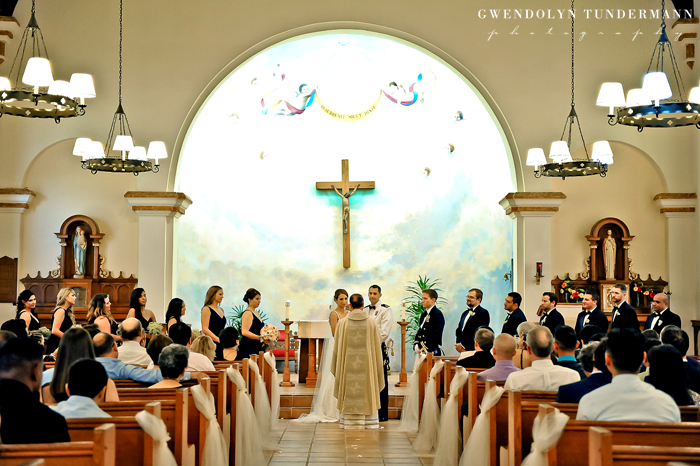 After leaving the church, they departed on a trolley for a ride around San Diego. 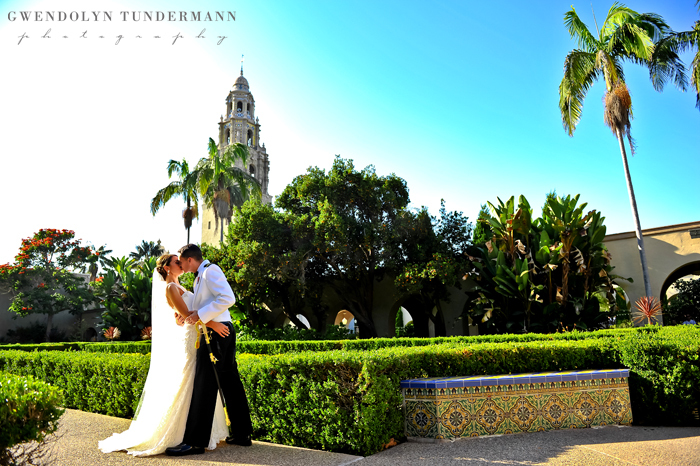 We stopped for more wedding photos at Balboa Park, and again everyone stopped to see the bride and groom. 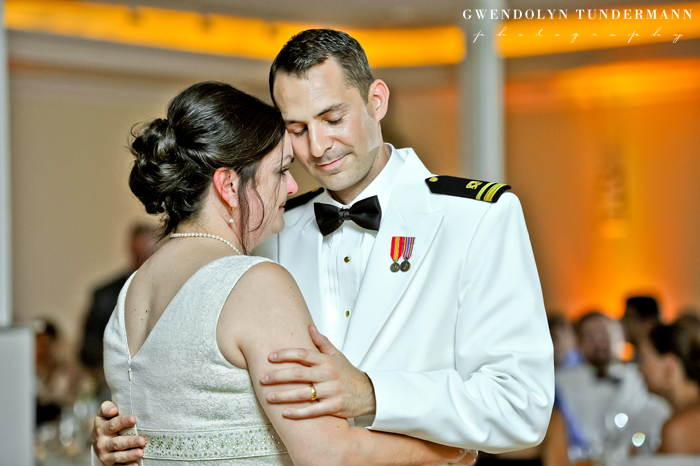 One woman saw Carolyn and said, “Oh my God, she’s stunning!” And with Patrick in his uniform, he truly looked like Prince Charming. 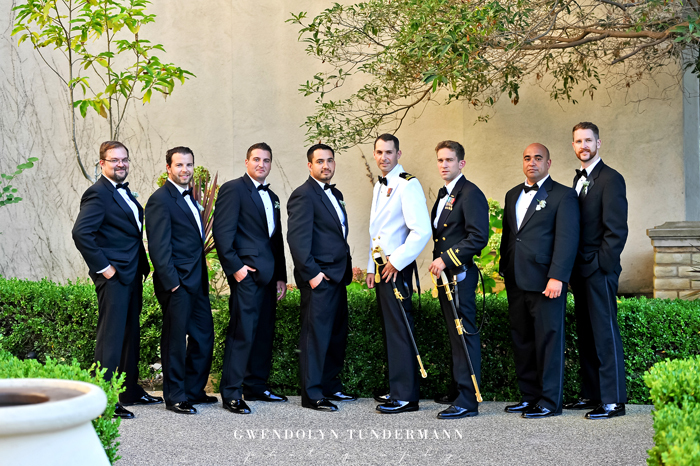 While we’re on the subject of how great everyone looked, the wedding party got me to admit they were the hottest wedding party we’d ever seen! 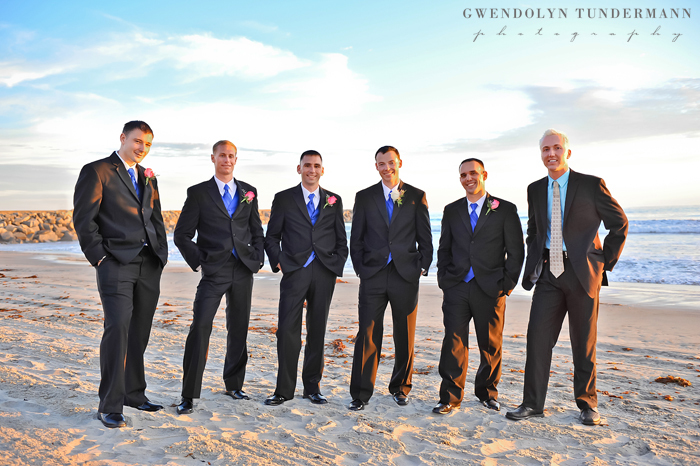 Such a fun group! 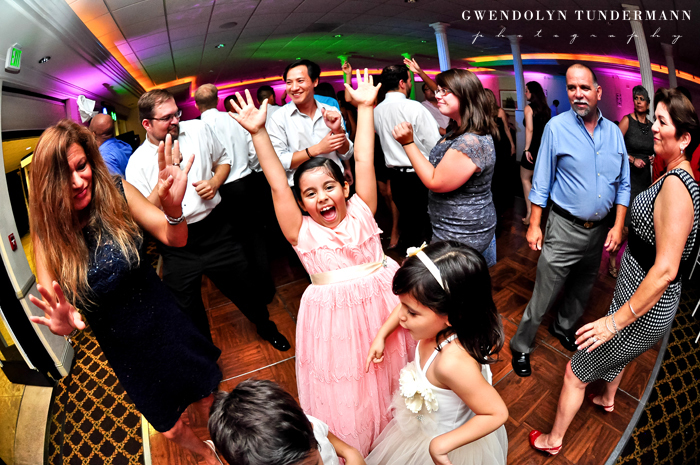 Roya & JJ have this effect on everyone they meet. 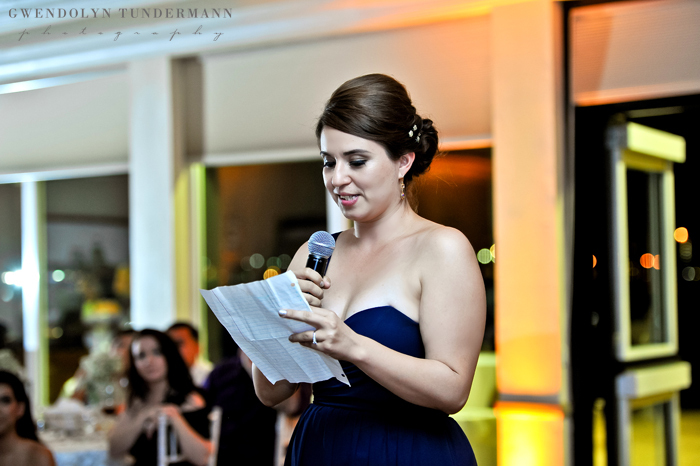 From the speeches given by their friends and family, everyone agrees that they are the kind of people that you just instantly adore. 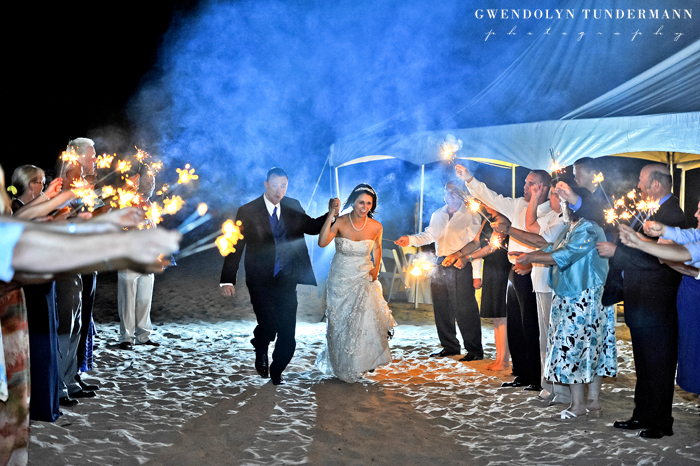 It seems perfect that they would find each other, because the two of them together just makes sense! 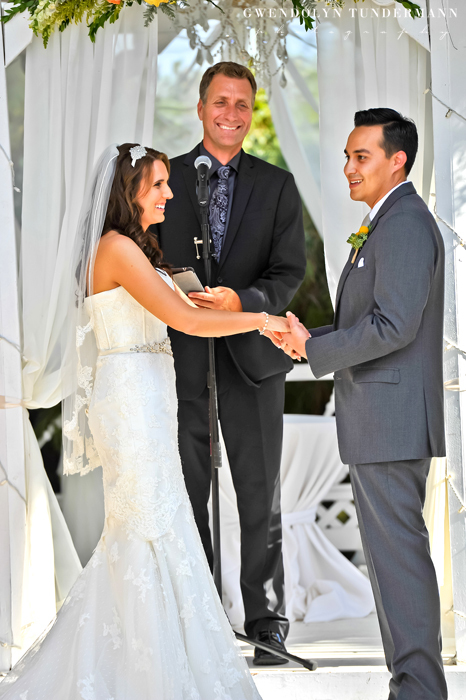 Their wedding was a day full of fun times, including one of the craziest cake cuttings I’ve ever seen. 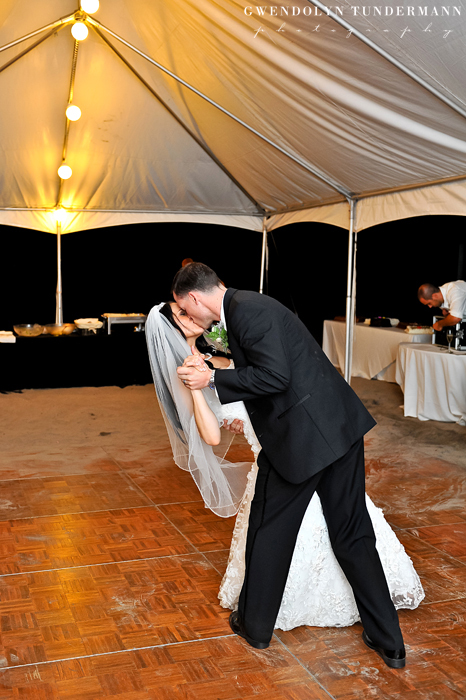 I wasn’t expecting it to be so messy, but I soon realized that I shouldn’t have been surprised. 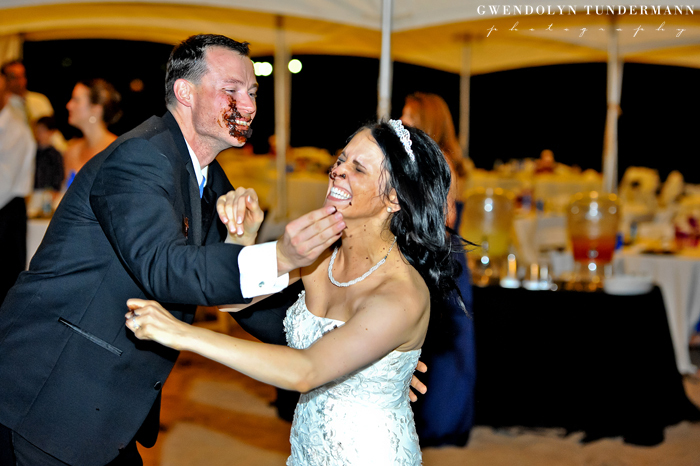 They are playful and carefree, and you can only get away with this kind of cake smash if you have a great sense of humor! 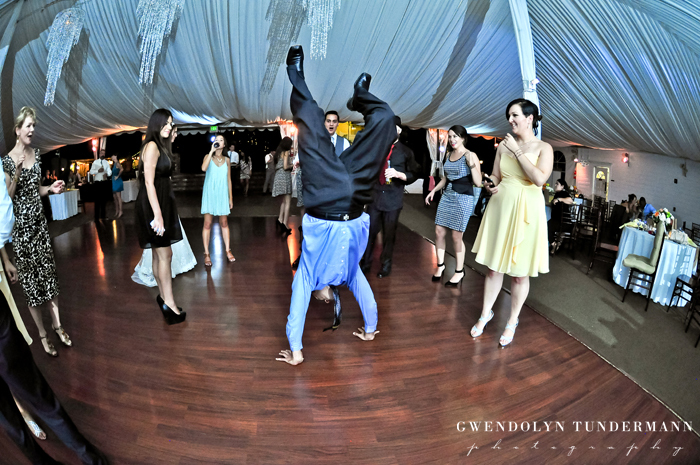 For the record though… I think Roya won! 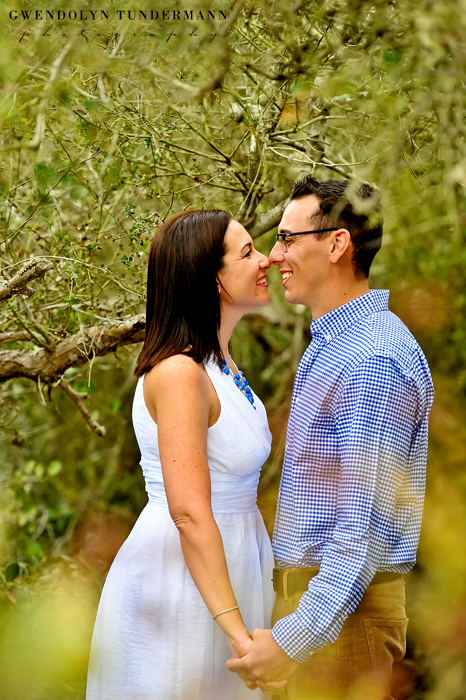 This is just one chapter in their “Adventure Book.” We wish them both a lifetime full of days like this, filled with fun times and surrounded by the people they love! 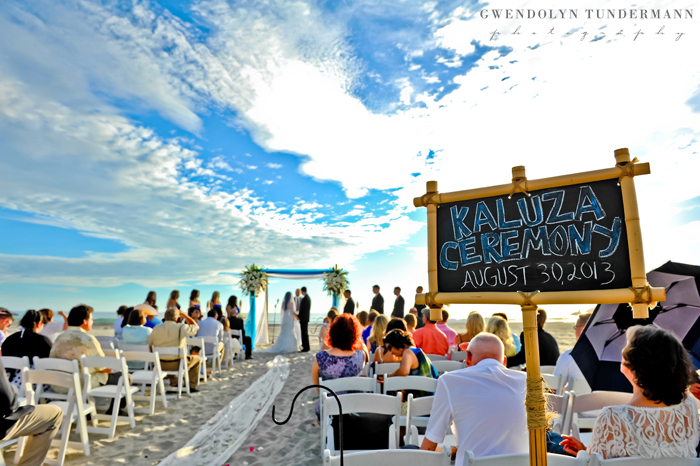 Congratulations Mr. and Mrs. Kaluza!